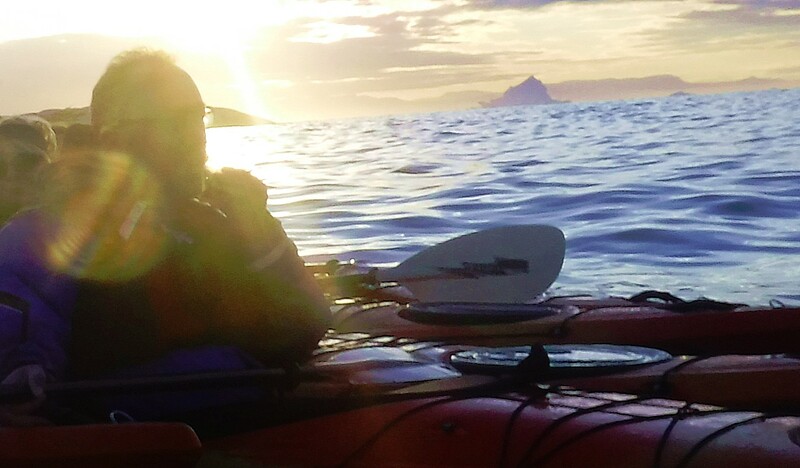 It had become evening and satisfied after a good dinner, I was ready for yet another adventure, actually one that had been on my mind for years. 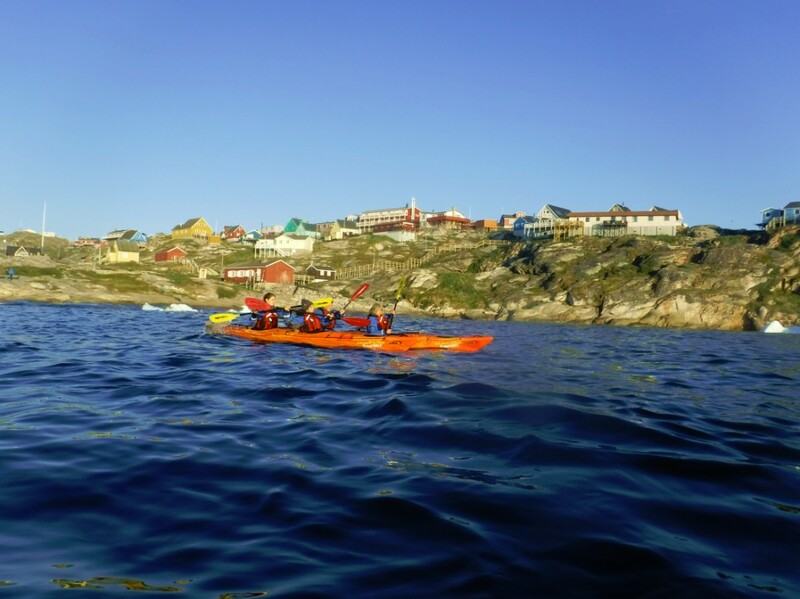 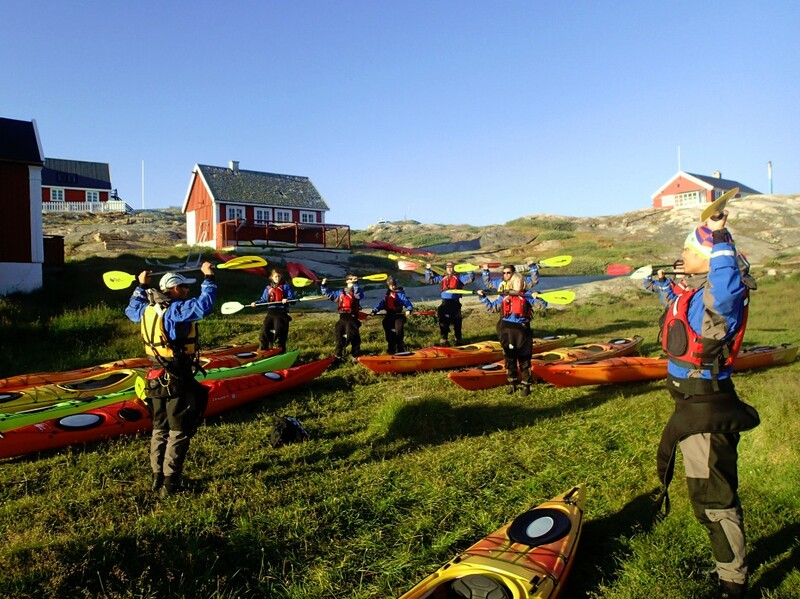 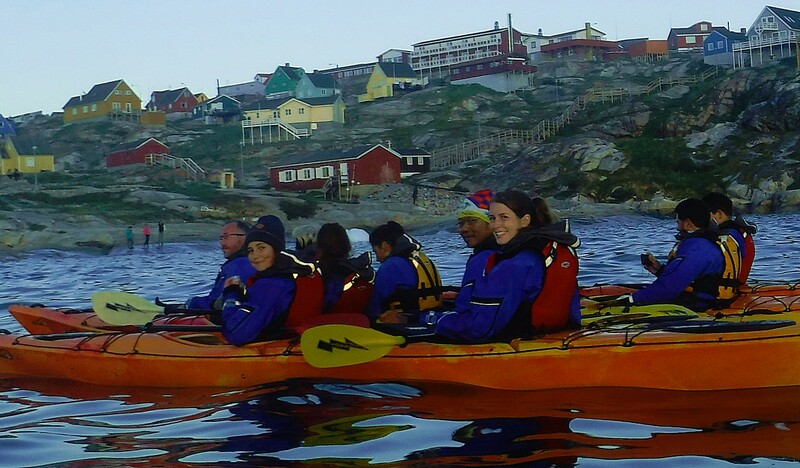 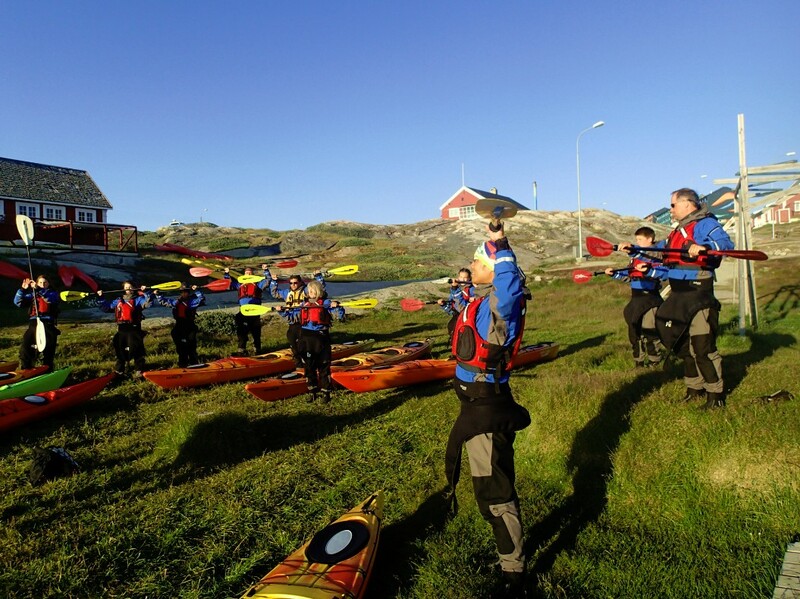 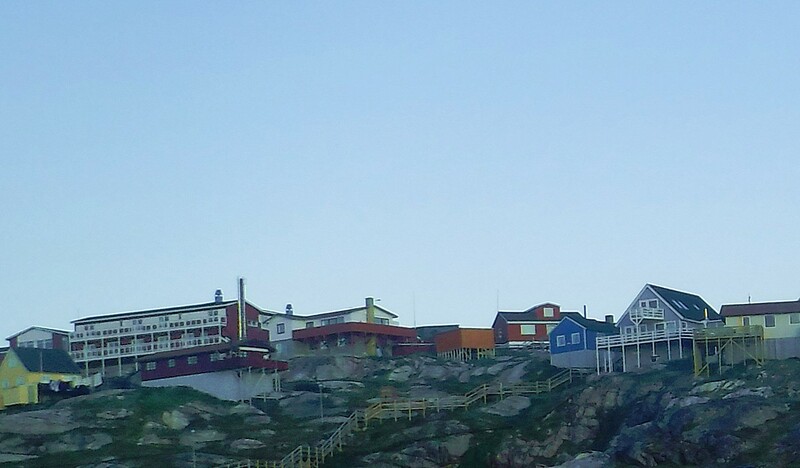 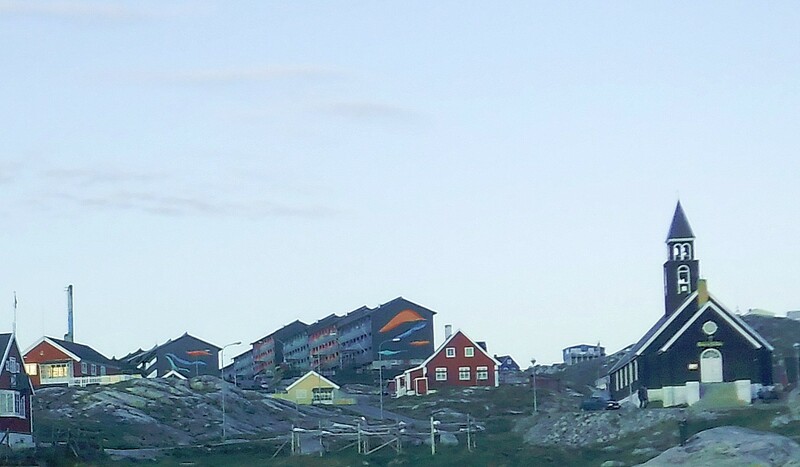 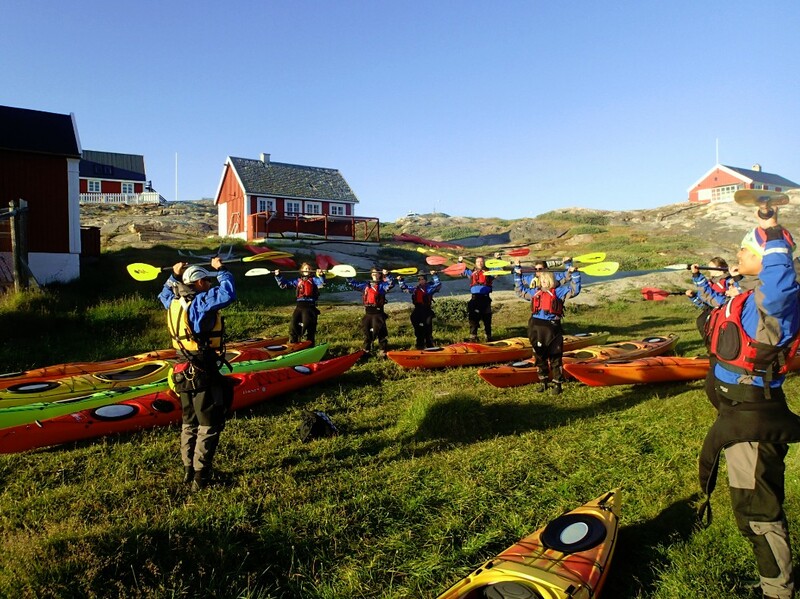 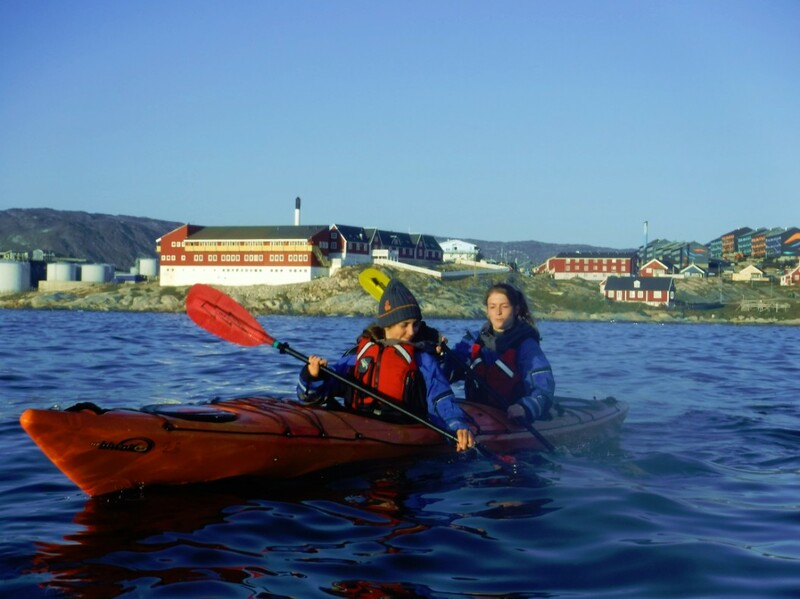 So I grabbed my stuff and returned into Ilulissat to the office of PGI-Greenland to participate in a kayak adventure in Disko Bay. 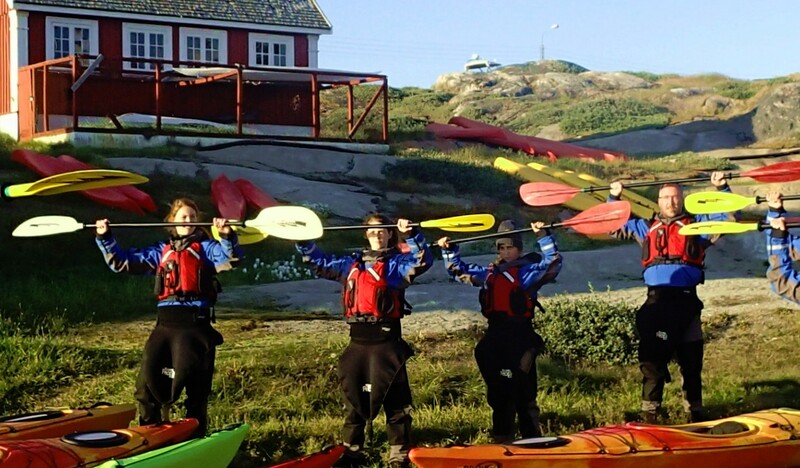 At PGI they handle things very professionally. 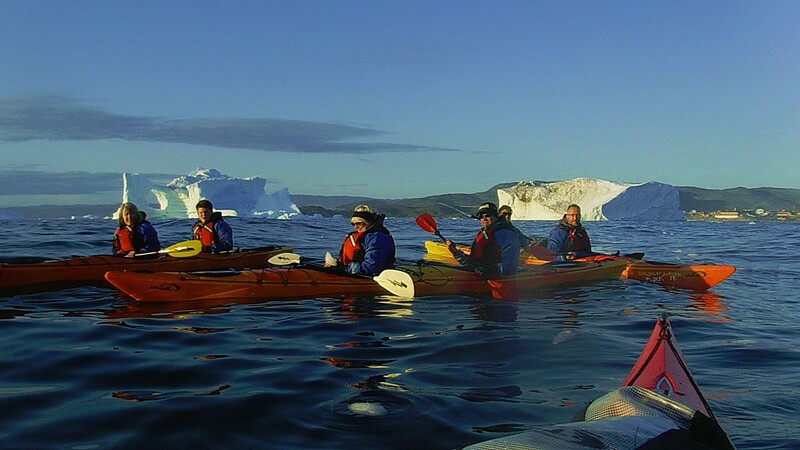 Their kayak tours are even open to those who never kayakked before. 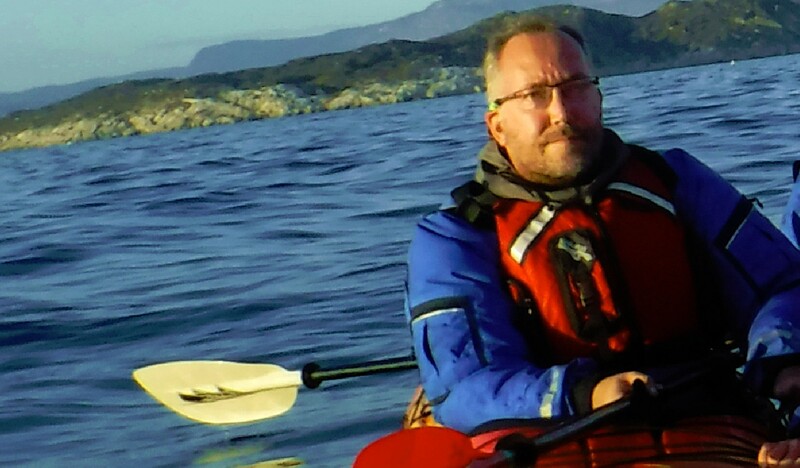 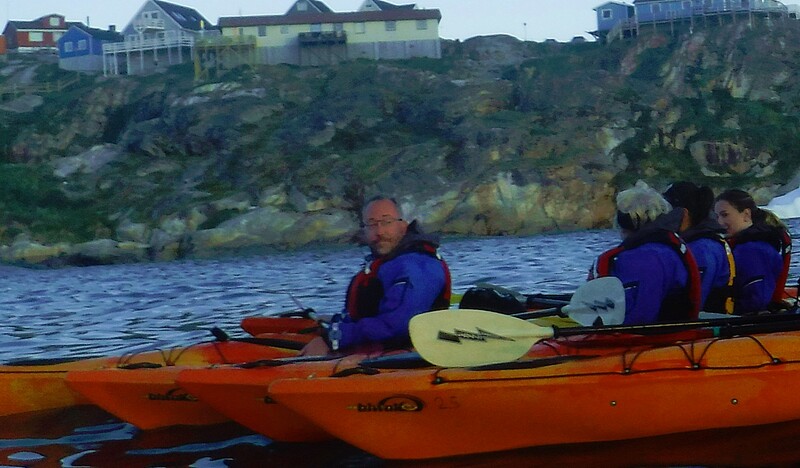 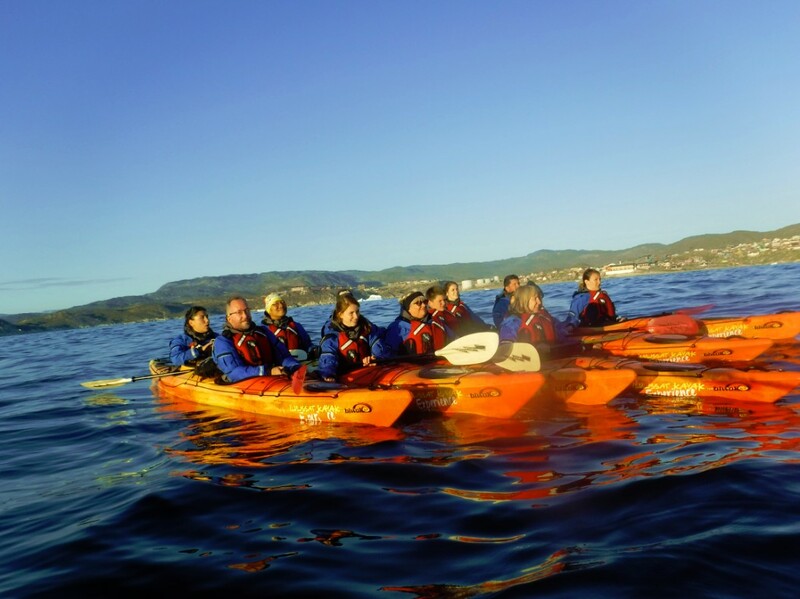 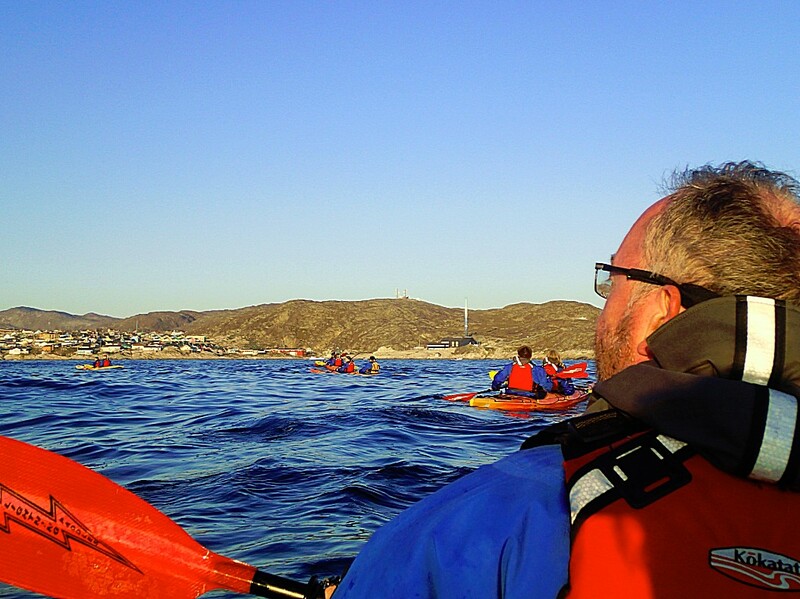 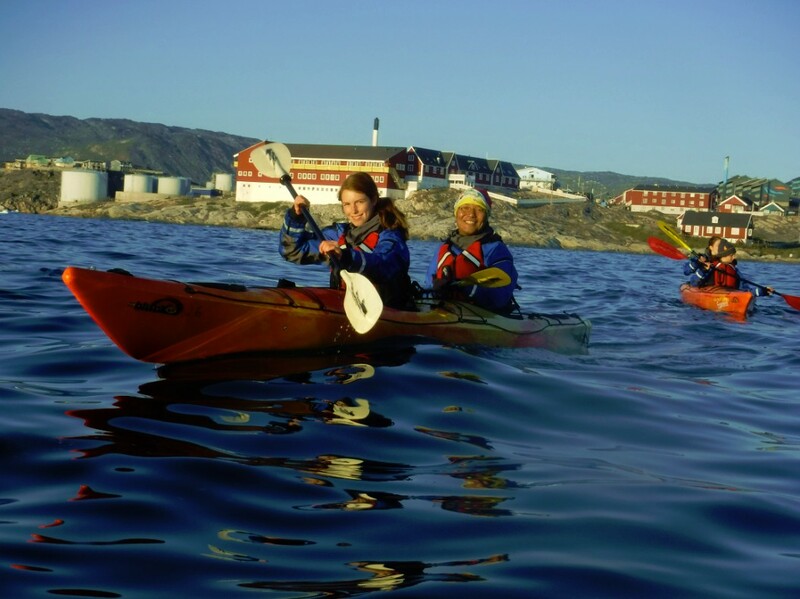 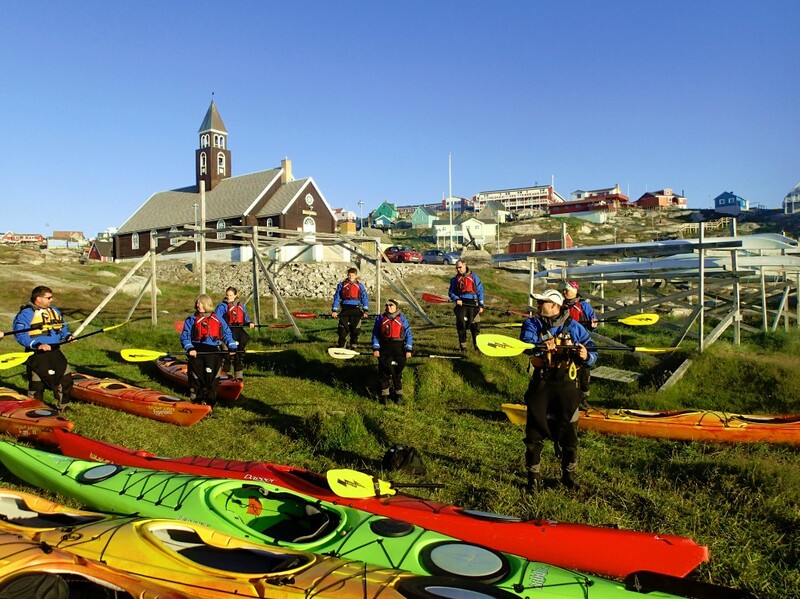 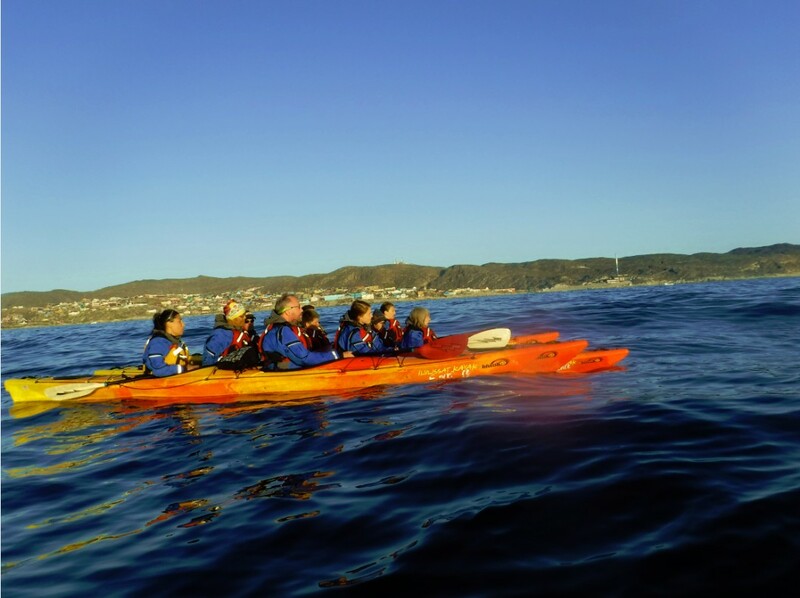 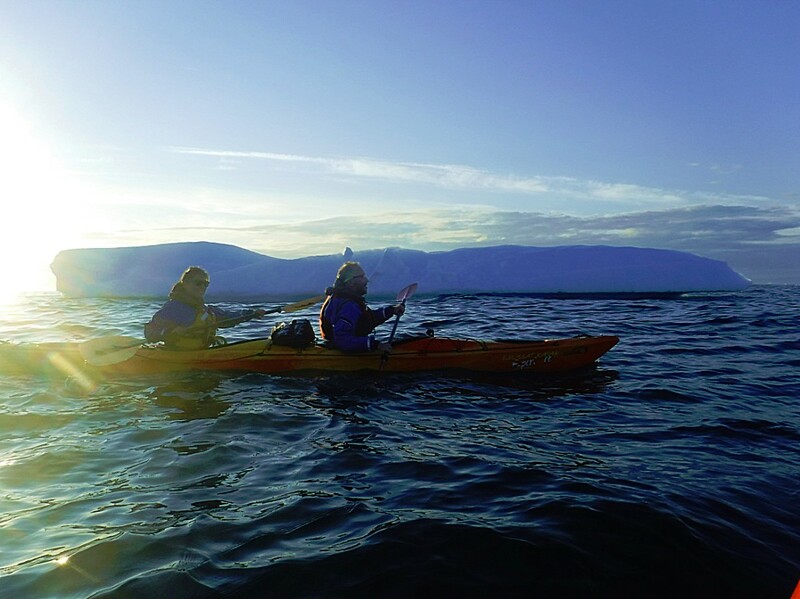 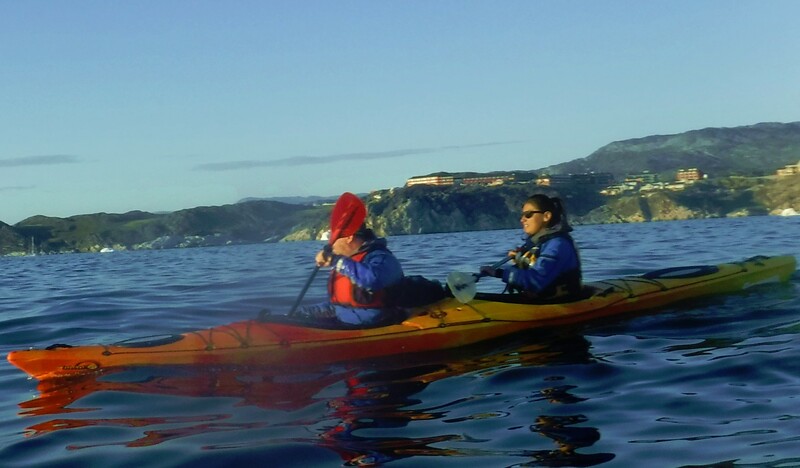 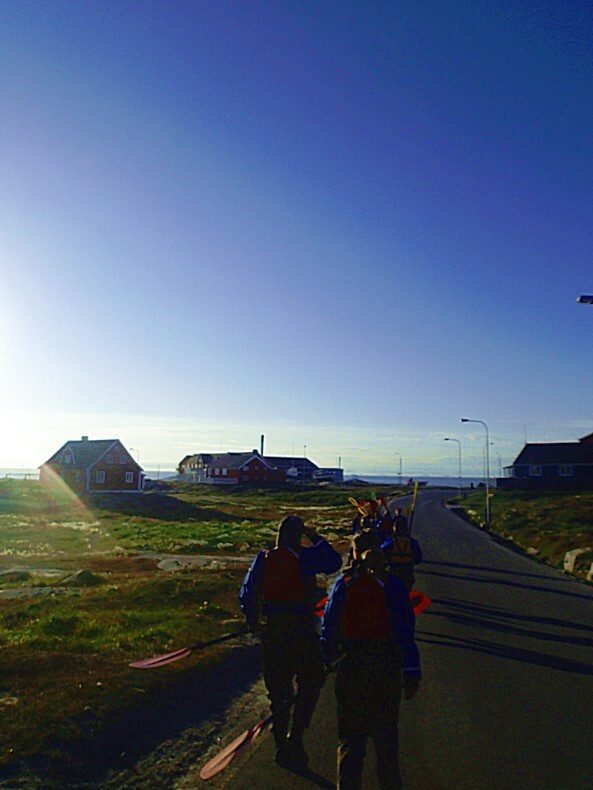 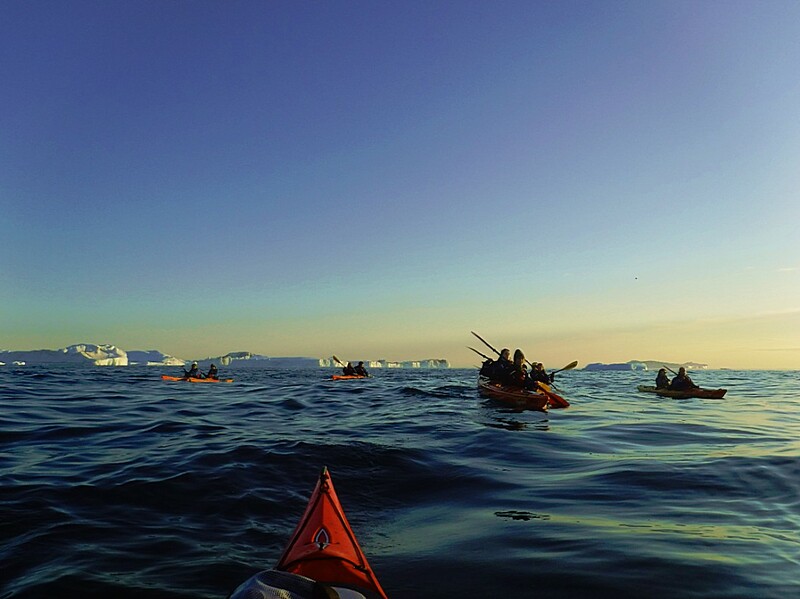 For me it was the very 1st time kayaking and also the 1st time doing this in arctic waters. 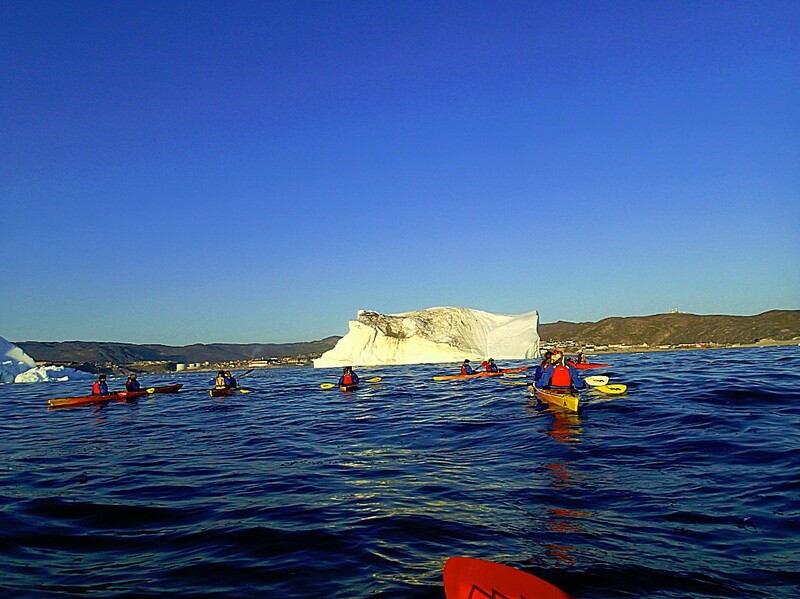 It appeared that everyone in my kayak group was as inexperienced as I was. 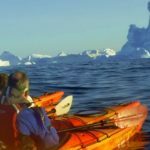 I did have canoeing experience in Europe, Asia and Africa but that was all in relatively warm waters and a canoe is quite different from a kayak as I would soon experience myself. 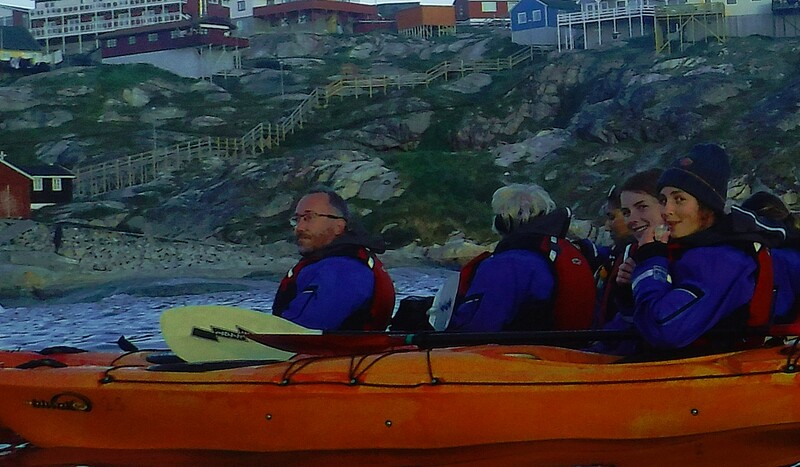 On the beach we received a training in how to hold and use our paddles. 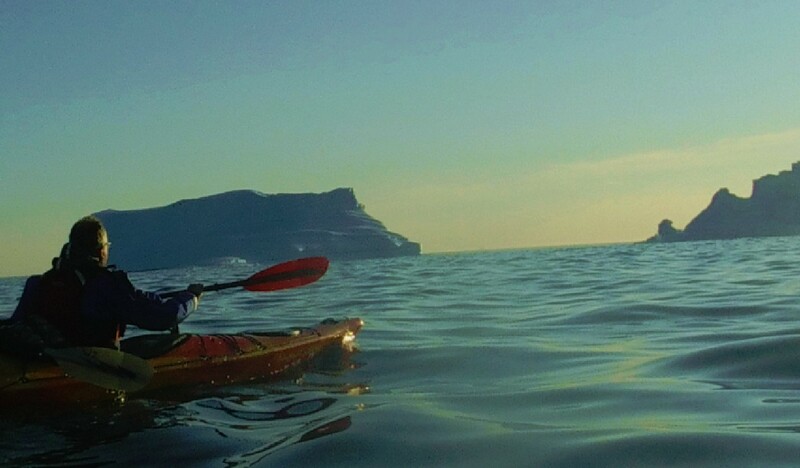 The main difference between using a paddle when canoeing or kayaking is that the paddle is put less deep into the water with kayaking because a kayak is less stable in the water then a canoe. 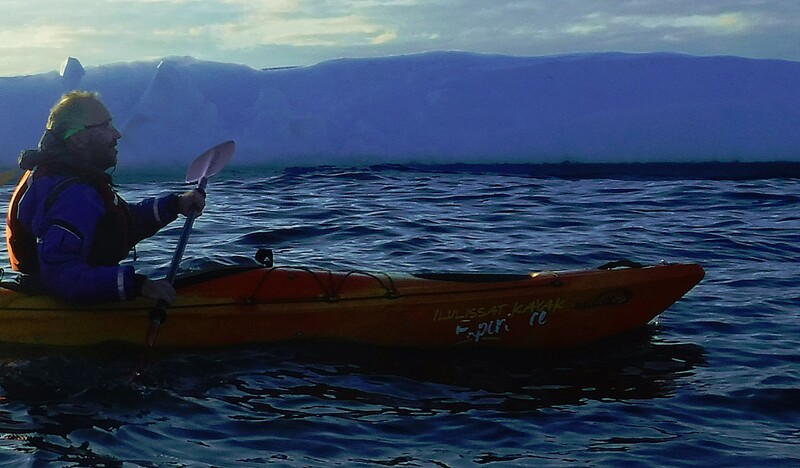 Paddling too deep can cause the kayak to turnover. 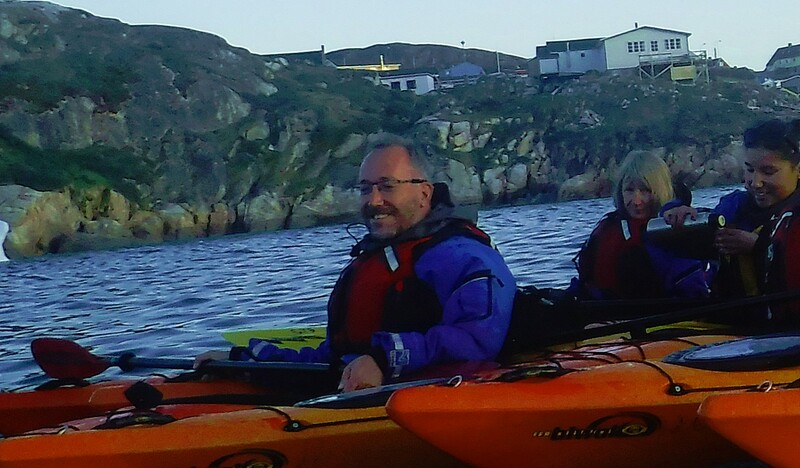 We also learned how to close the kayak entrance holes with a rubber piece and how to open the entrance hole in case the kayak turns over, after which you can leave the kayak and resurface. 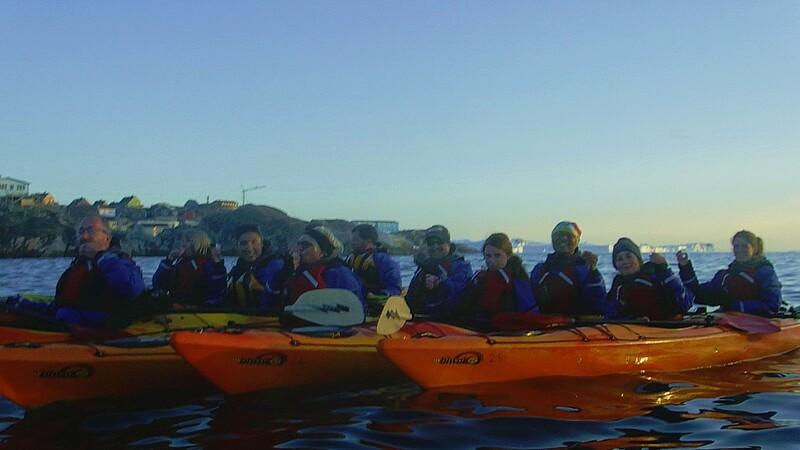 Last but not least, we learned another difference between kayaking and canoeing. 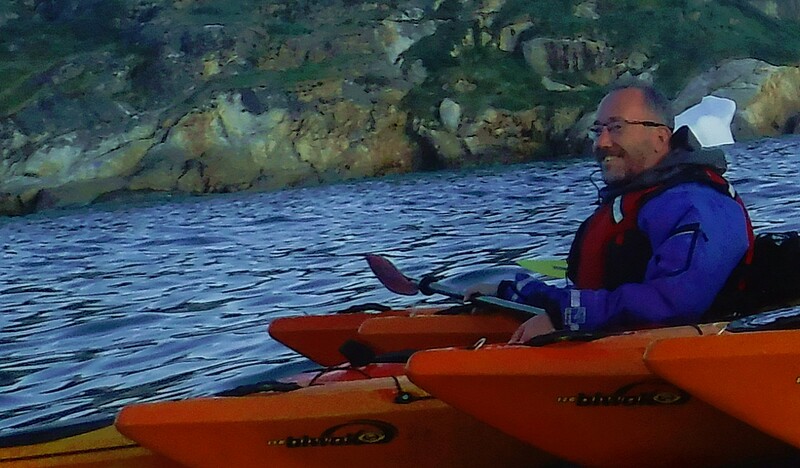 A kayak can be steered using thy waist. 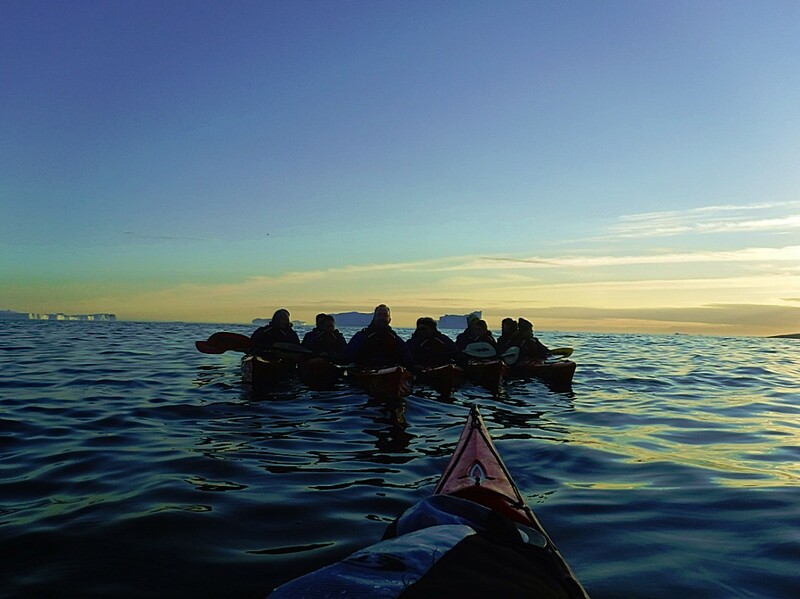 A canoe is heavier and you need the paddles to steer a canoe. 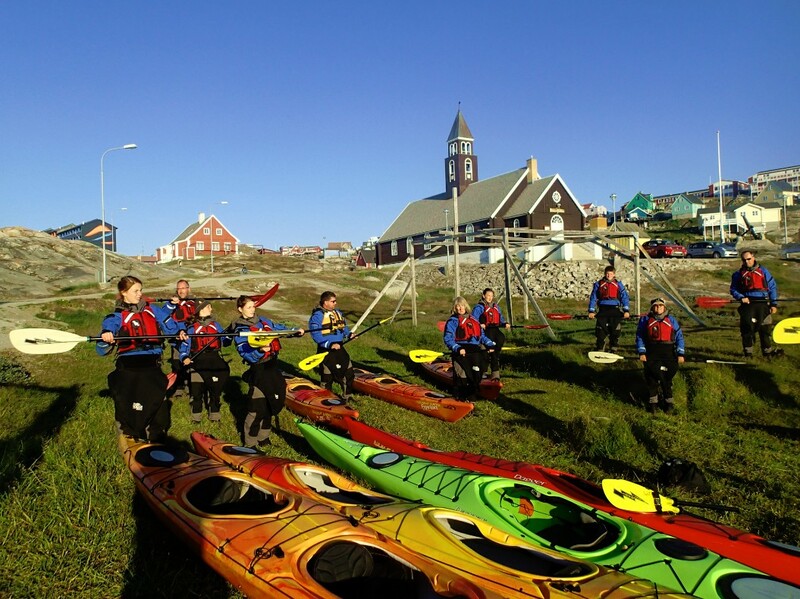 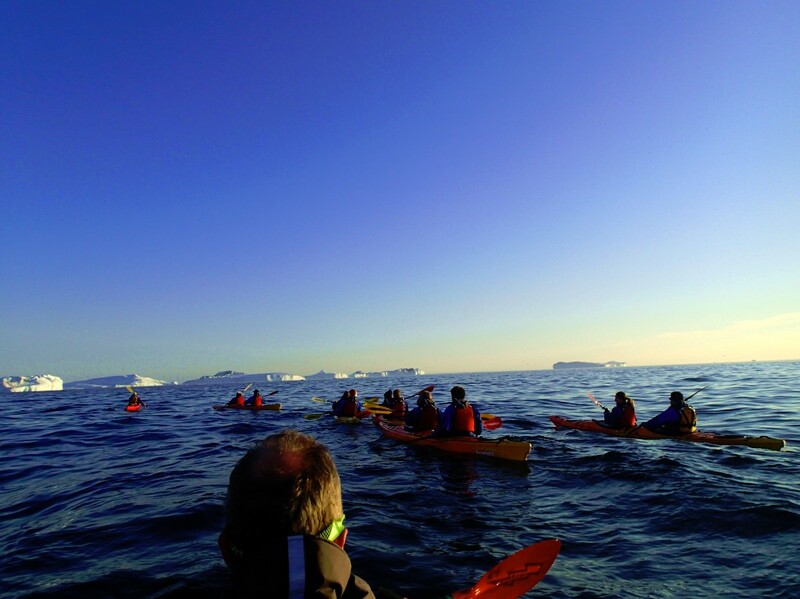 Then it was time to start the adventure and after we boarded our kayaks, we kayaked off towards the distant icebergs… More of that later in my next vlogs and blog?? 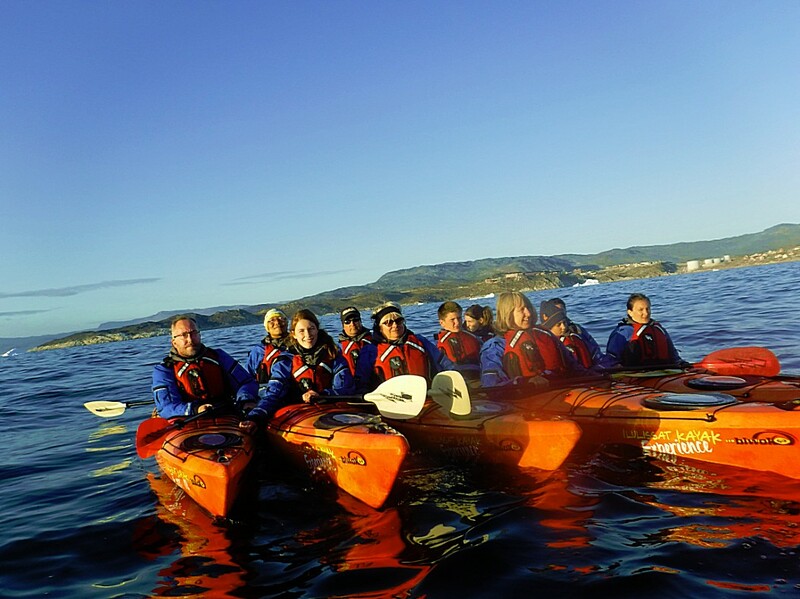 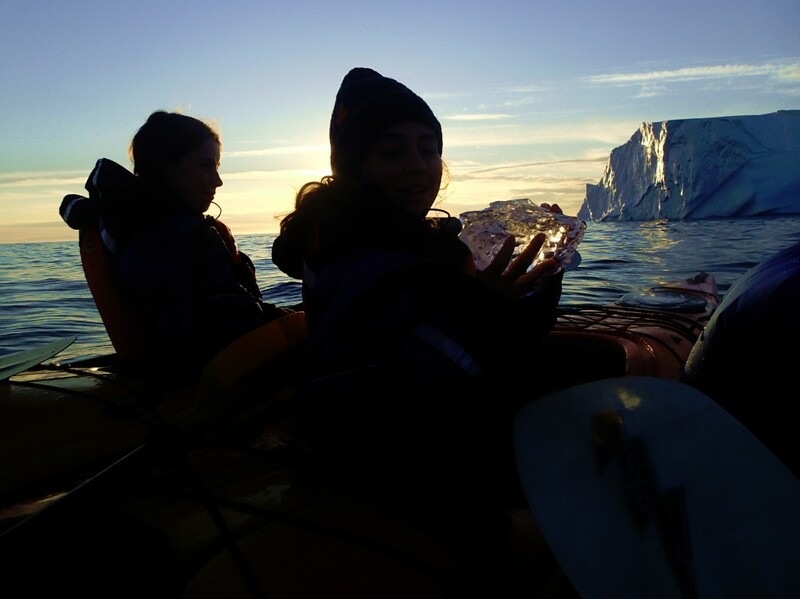 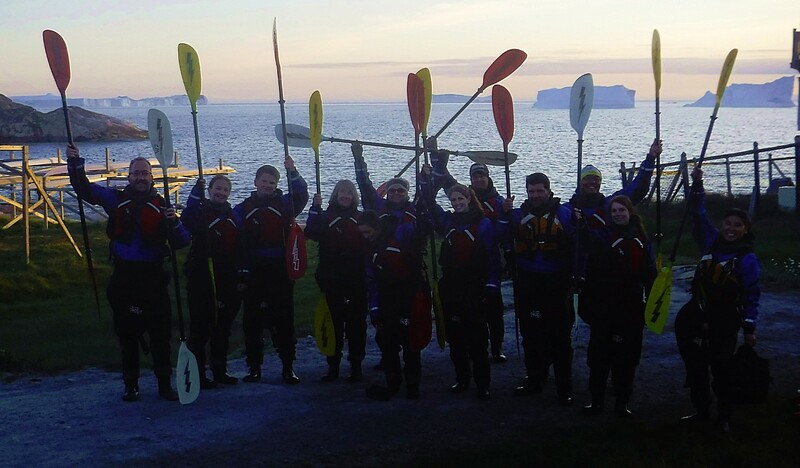 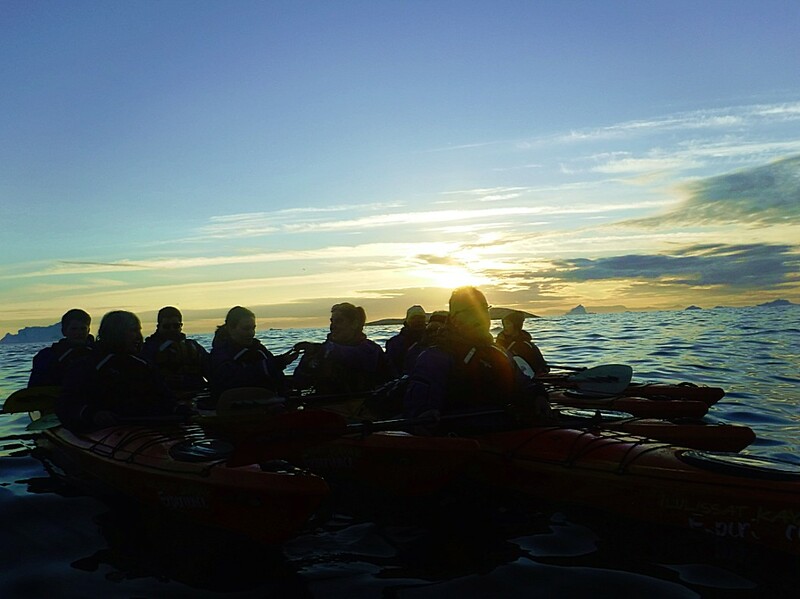 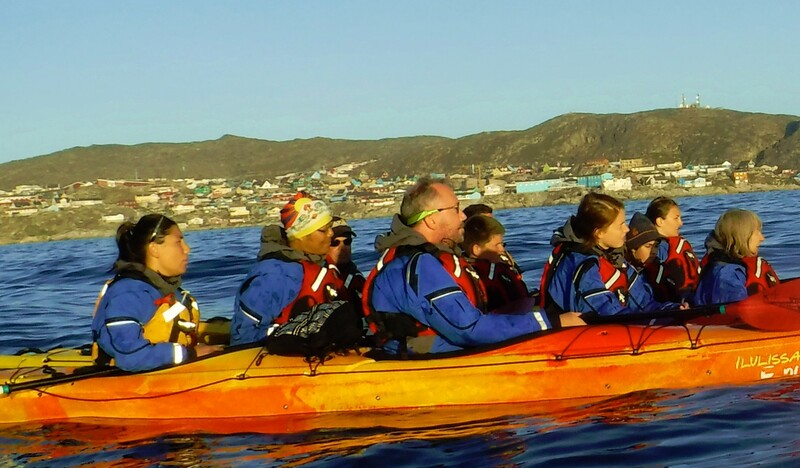 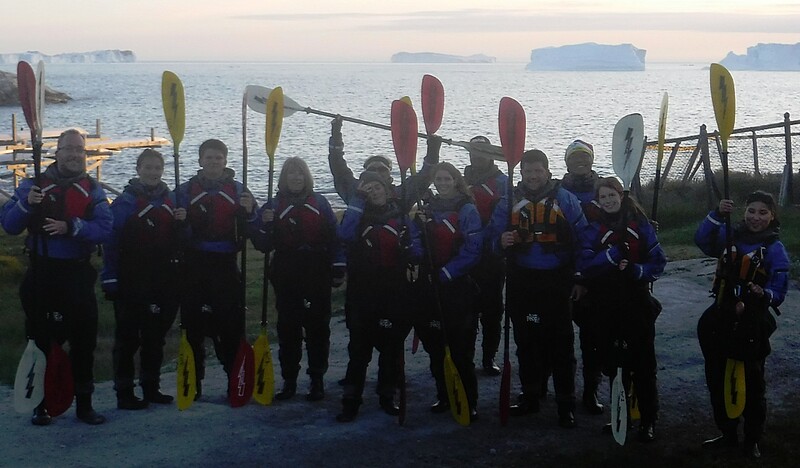 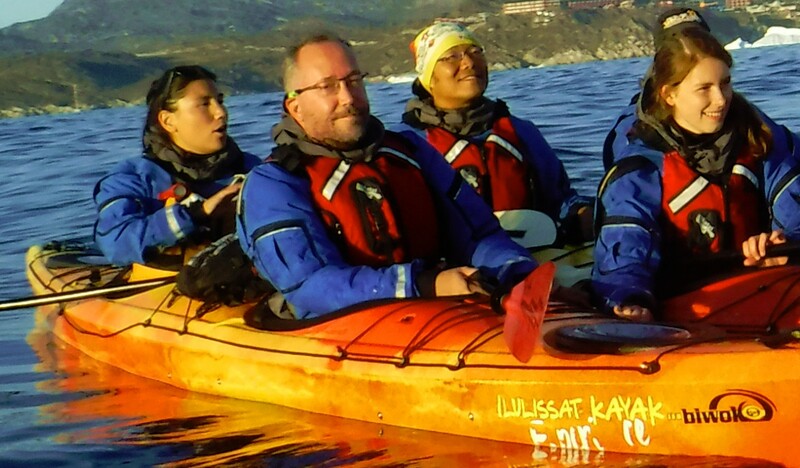 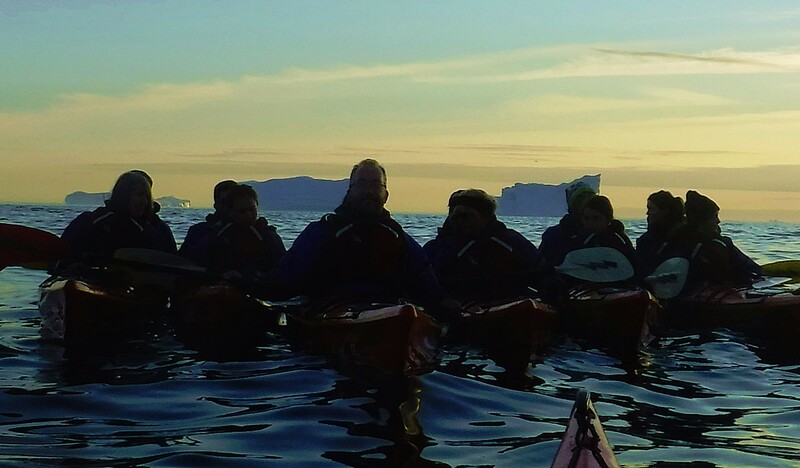 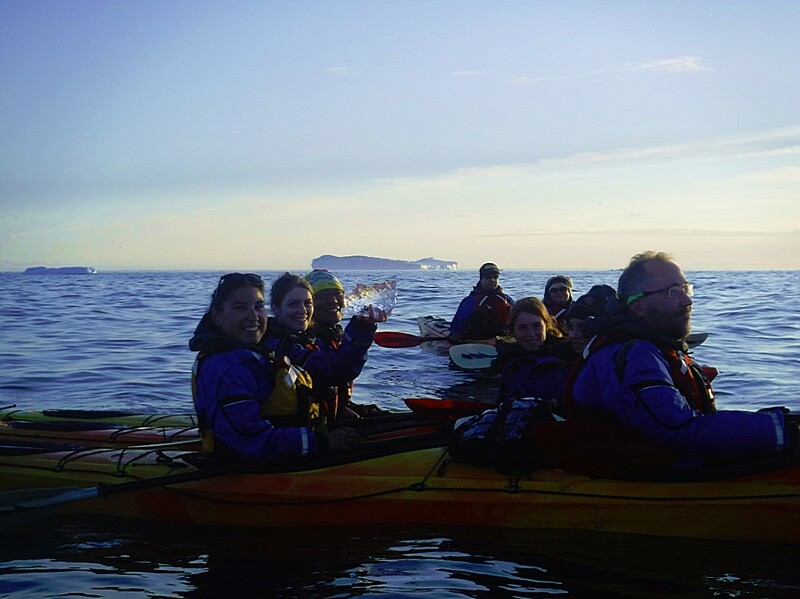 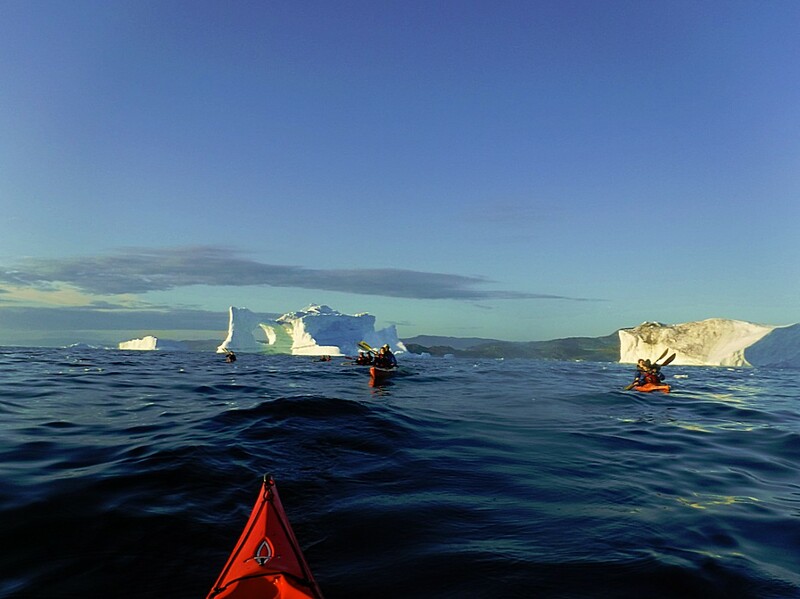 Before we arrived at the group of drifting icebergs, our kayak guides instructed us to get together. 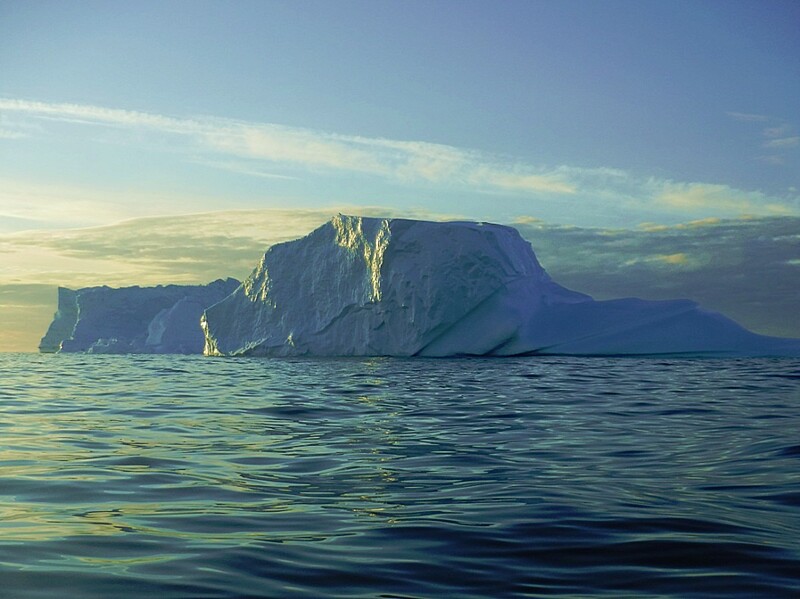 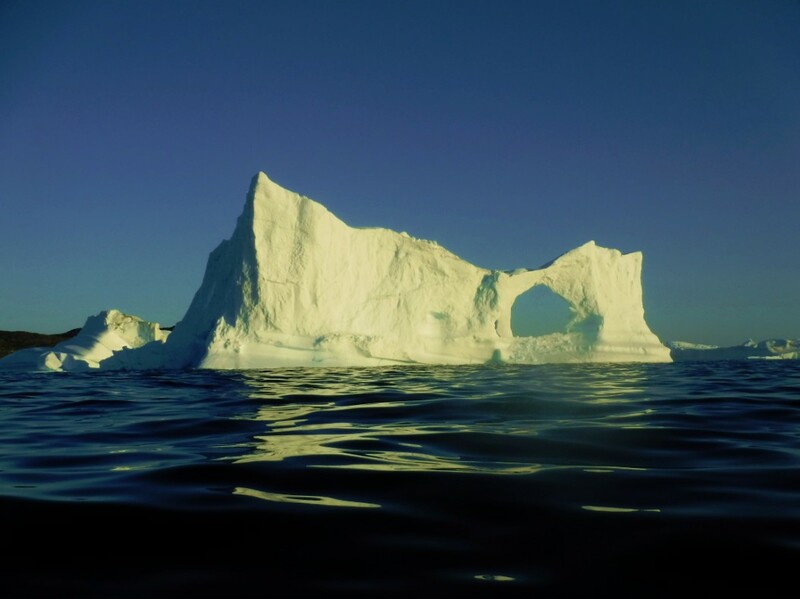 Then we were instructed, on which distance we would be able to safely pass the icebergs, because it is possible that pieces of ice break from an iceberg falling into the water causing waves…. 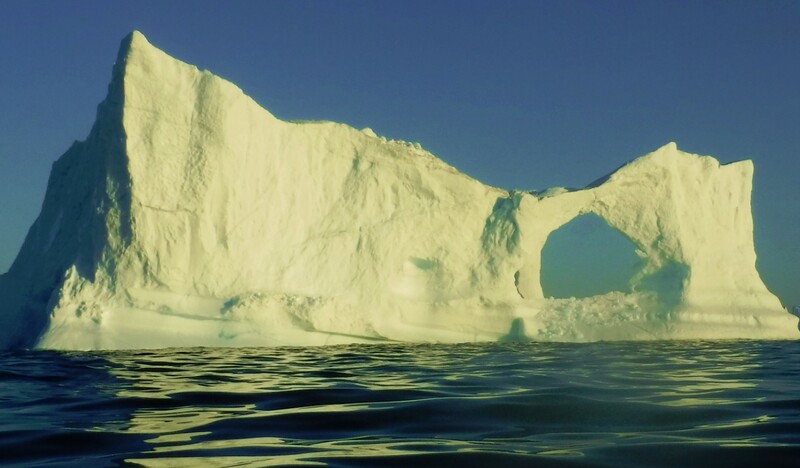 The large hole in this awesome iceberg was once a lake of icy turqoise water, which froze and gor covered by snow and more snow, freezing and changing into ice. 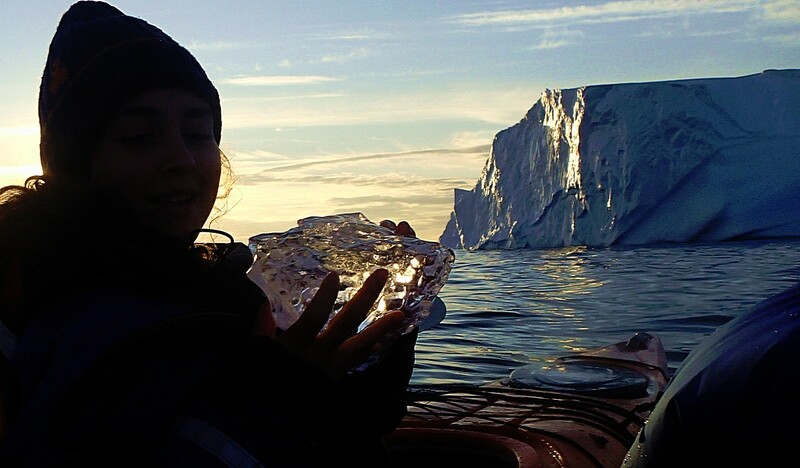 After this piece of ice broke free from the Sermeq Kujalleq glacier it drifted towards Dislo Bay and started to melt. 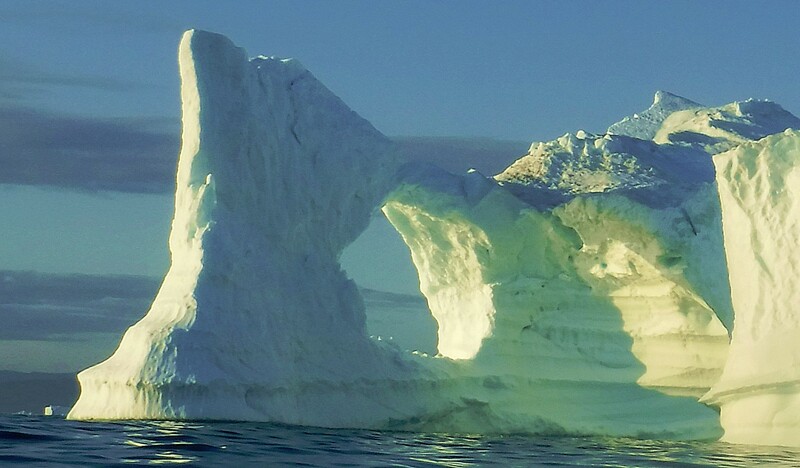 This iceberg turned over after the melting caused to change the weight balance. 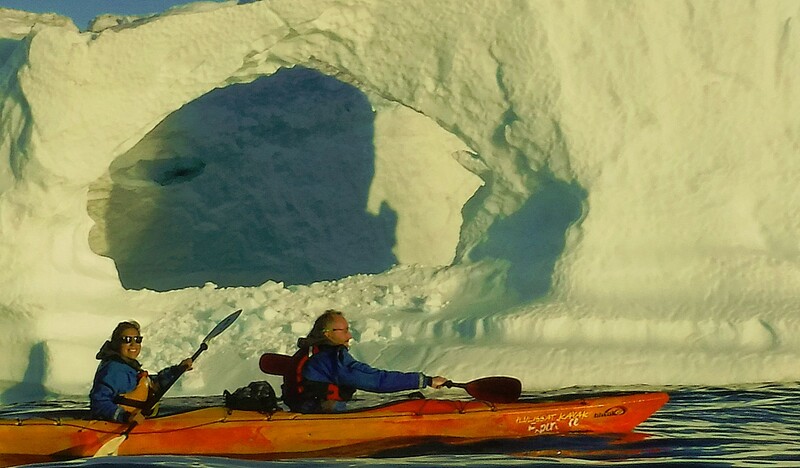 The frozen lake empties after it is opened, leaving this hole…. 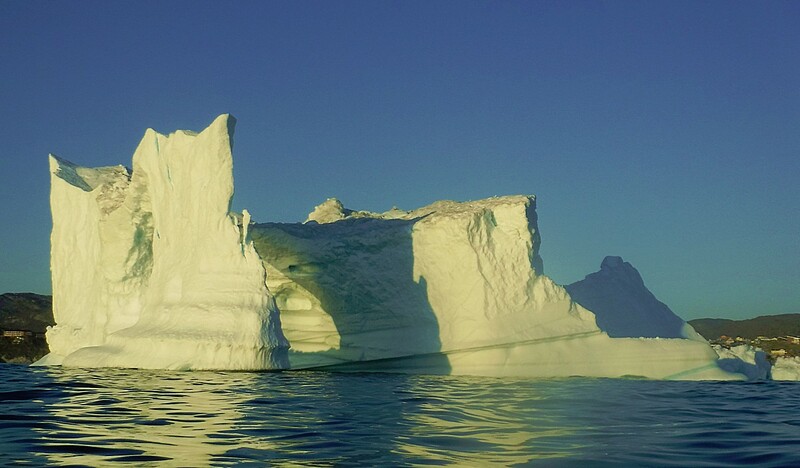 Inland ice (originating from compressed layers of snow) contains lots of air bubbles, whereas sea ice or ice originated from frozen water doesn’t. 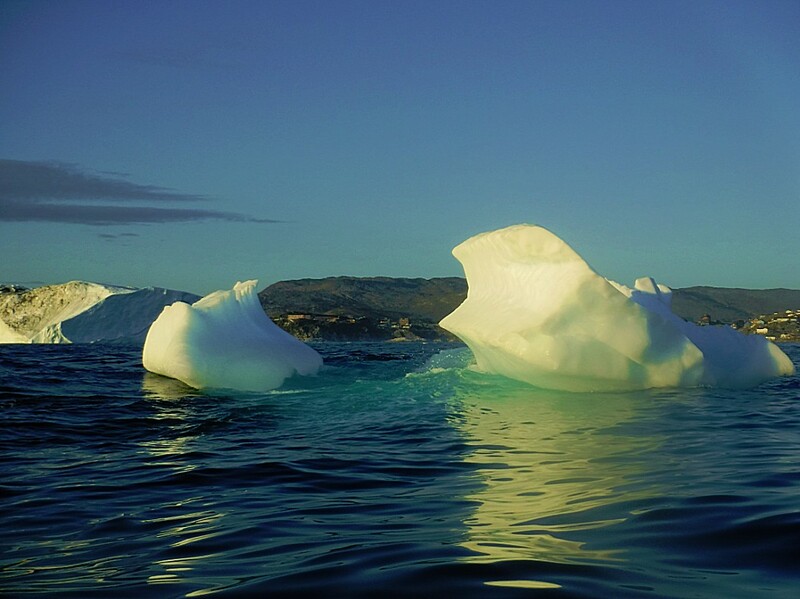 Icebergs or smaller pieces of ice broken from the Sermeq Kujalleq glacier, which produces them are actually inland ice. 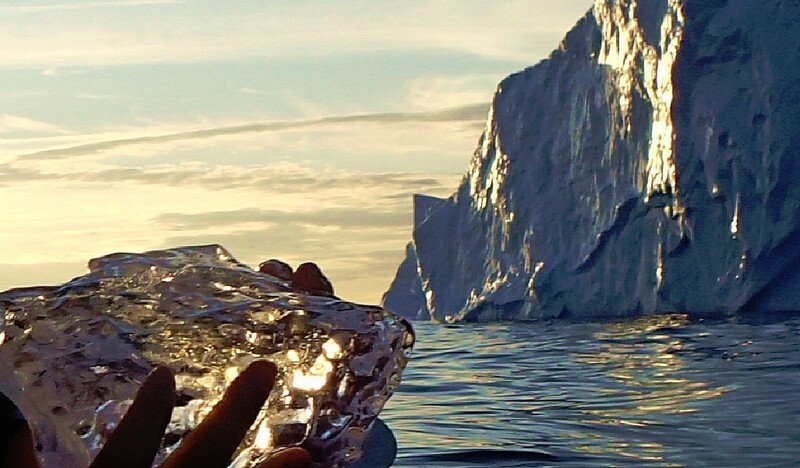 The air bubbles prevent sunlight from passing through the ice. 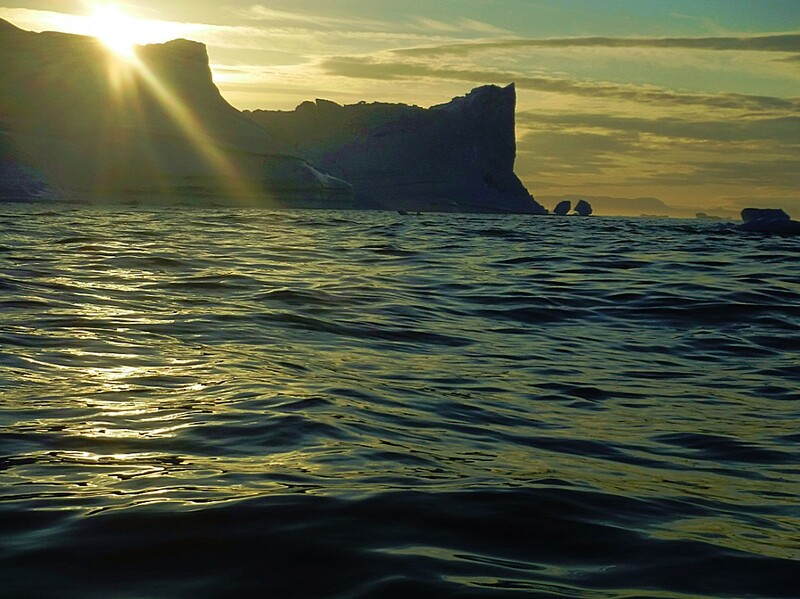 They reflect it and we see (in day time) a white light. 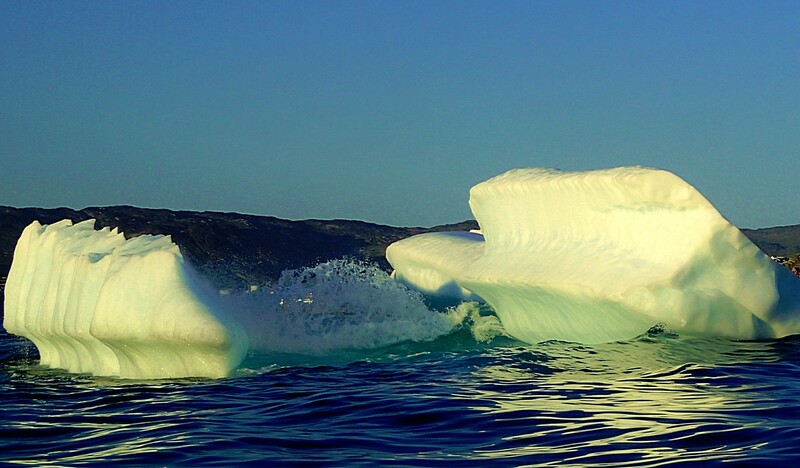 That’s why it is called white ice. 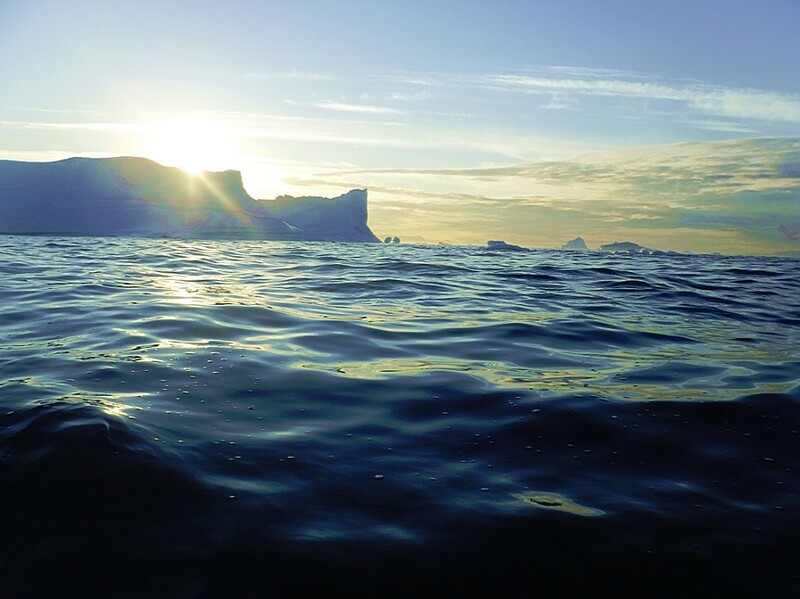 Sea ice however doesn’t contain compressed air bubbles and does let sunlight pass through. 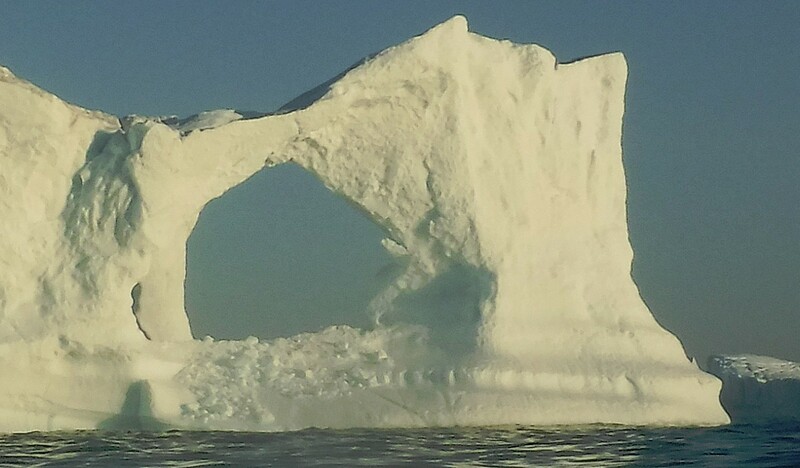 You can see through sea ice. 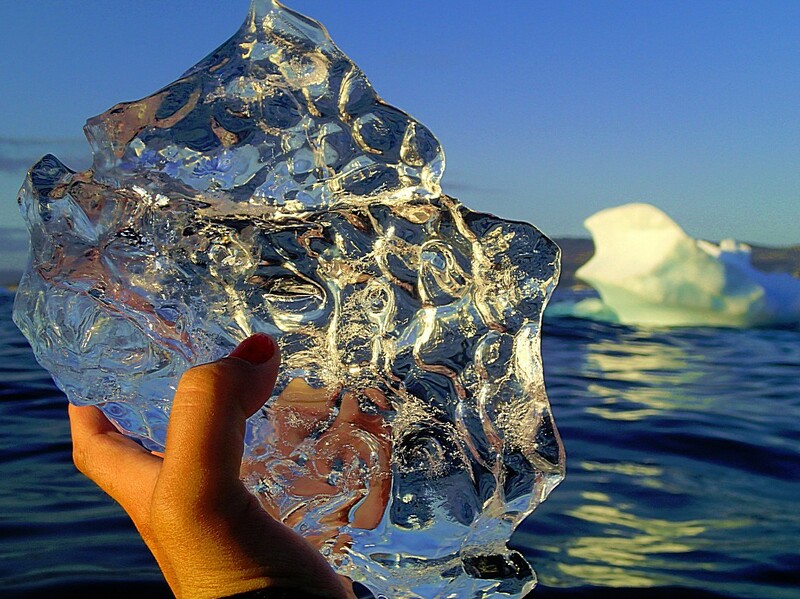 But it is not named see through ice. 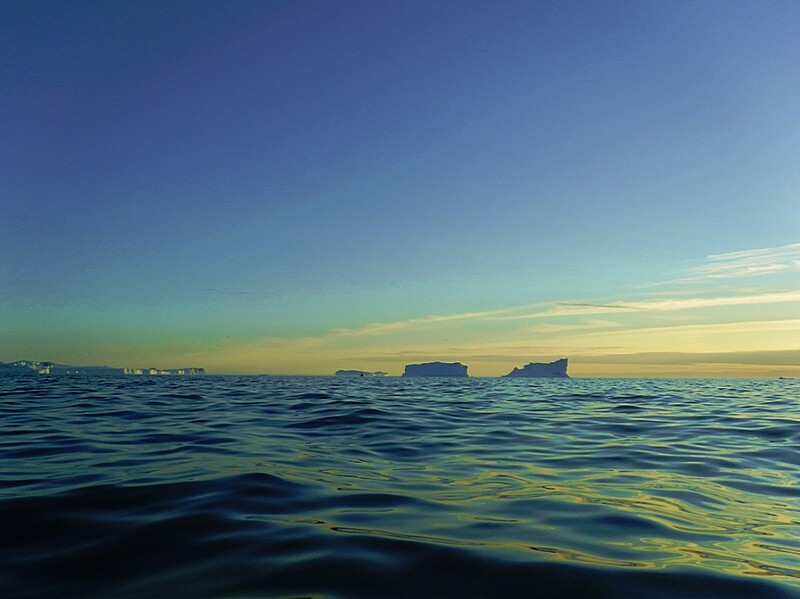 Whenever sea ice lies on the water surface it seems as dark as the depth of the sea. 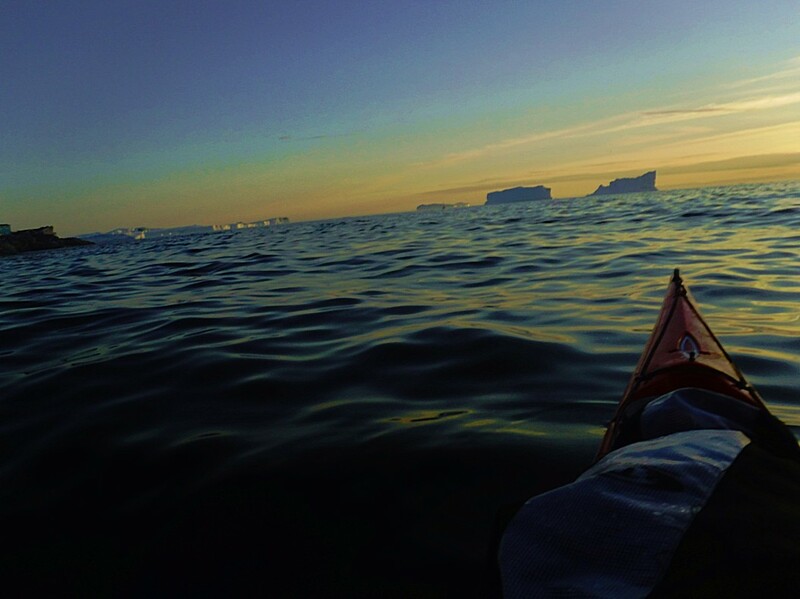 It still is see through ice, but you’re looking through the ice into the dark depths. 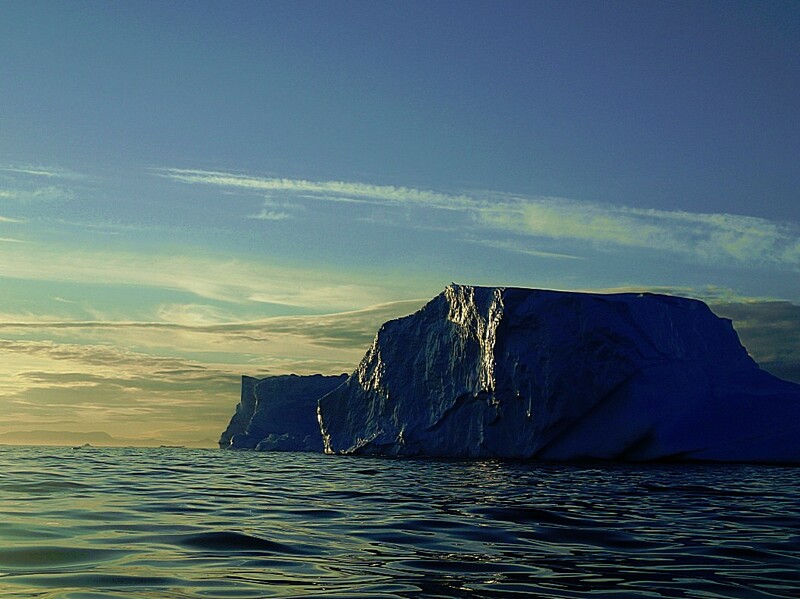 That’s why sea ice is named black ice. 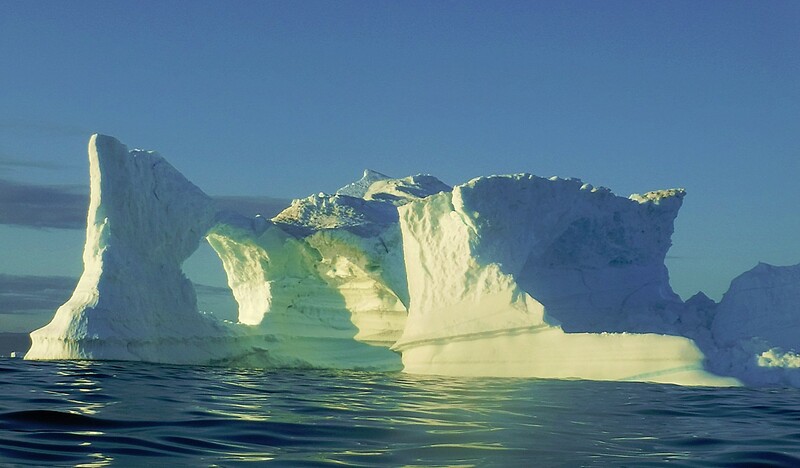 Sometimes sea ice can be white, but that is only the case when it has formed a larger surface of frozen water and is subsequently covered by snow. 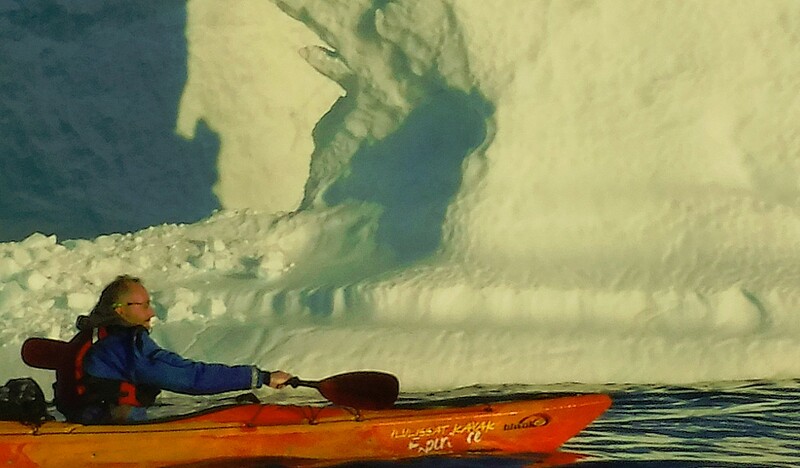 It is the snow that seems white to us. 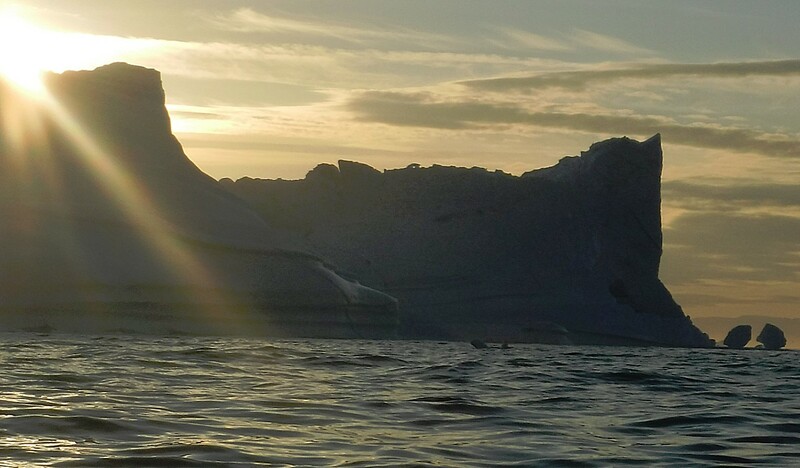 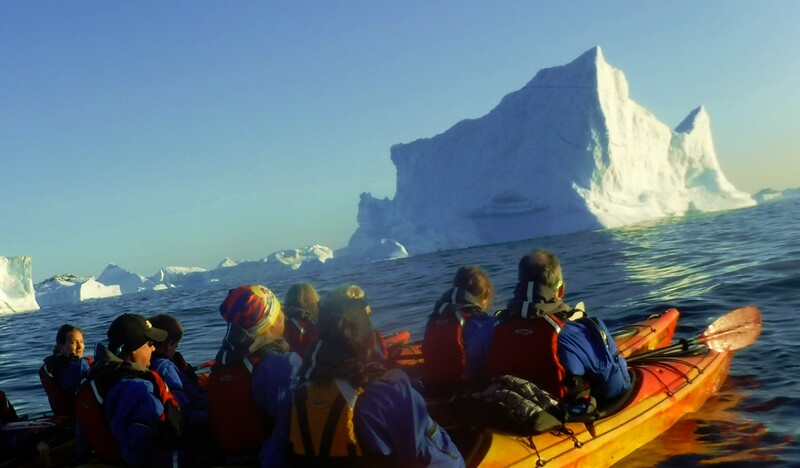 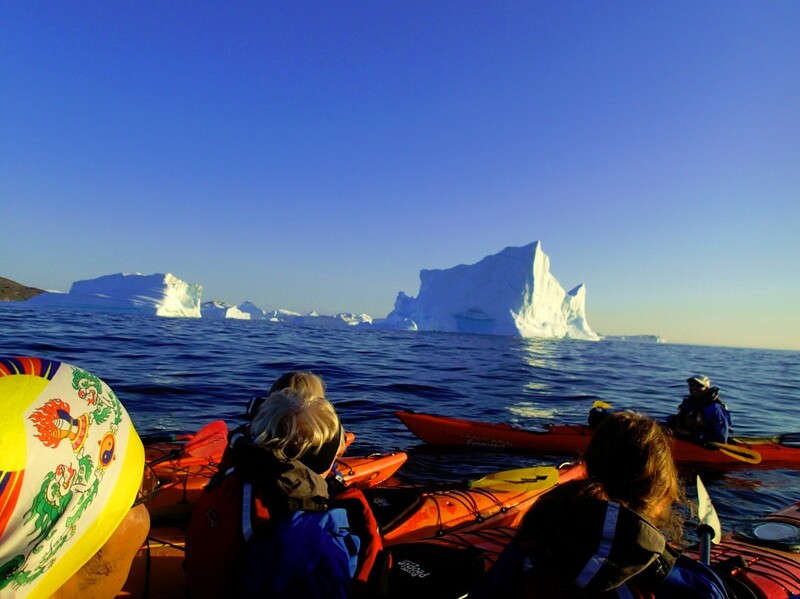 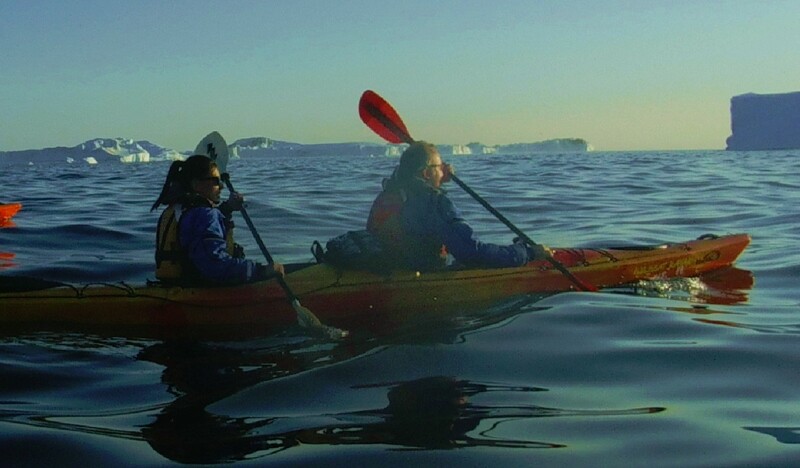 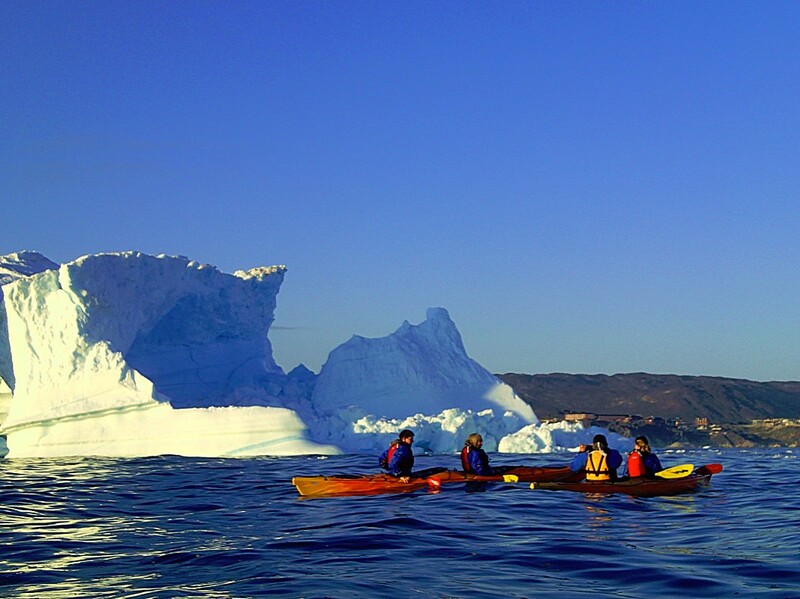 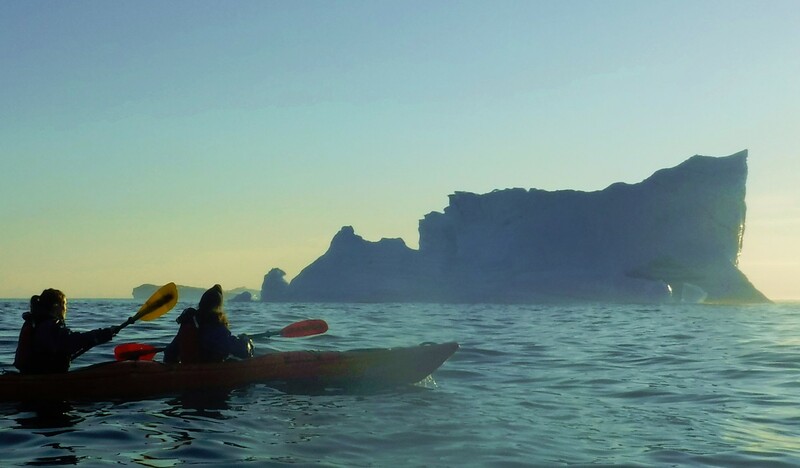 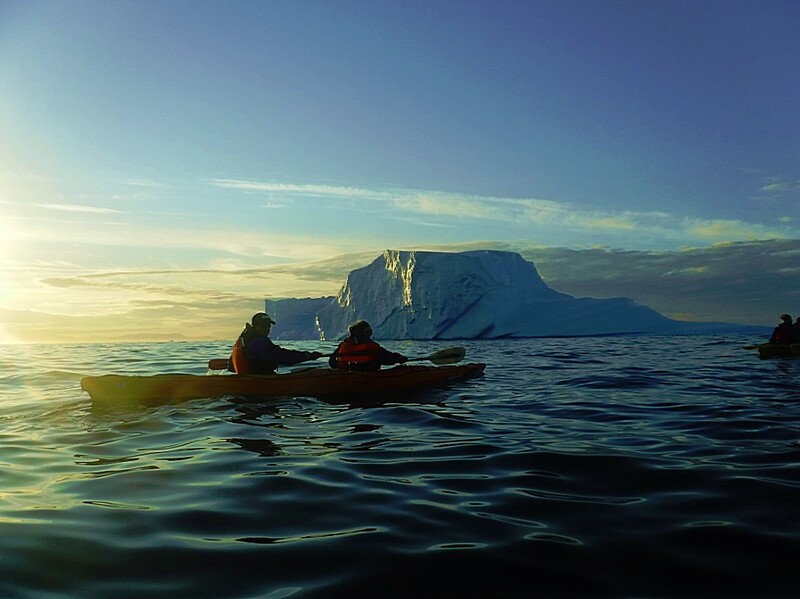 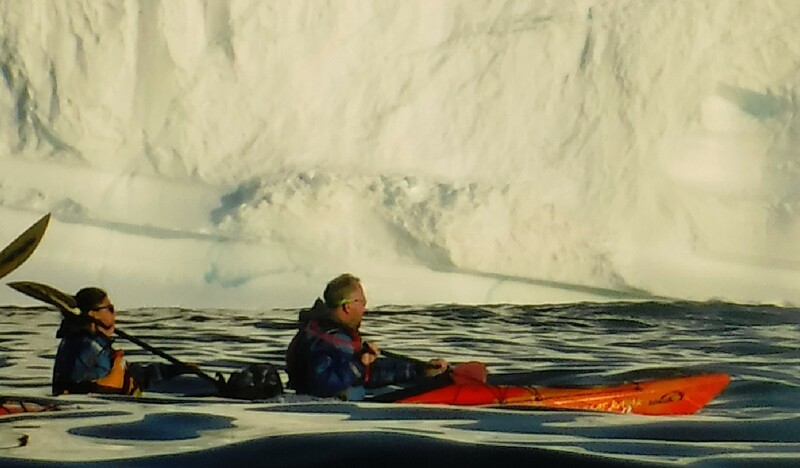 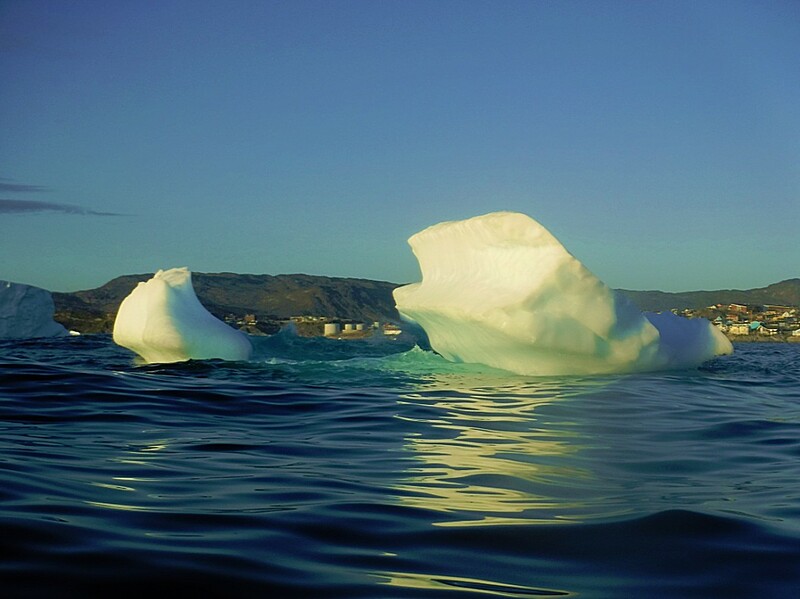 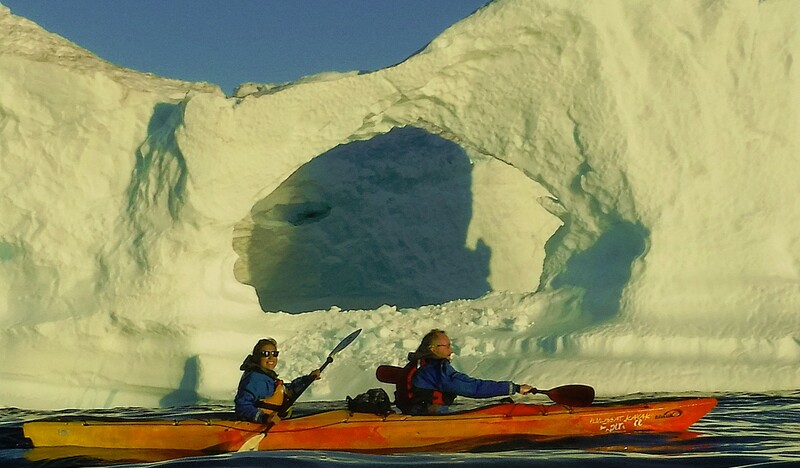 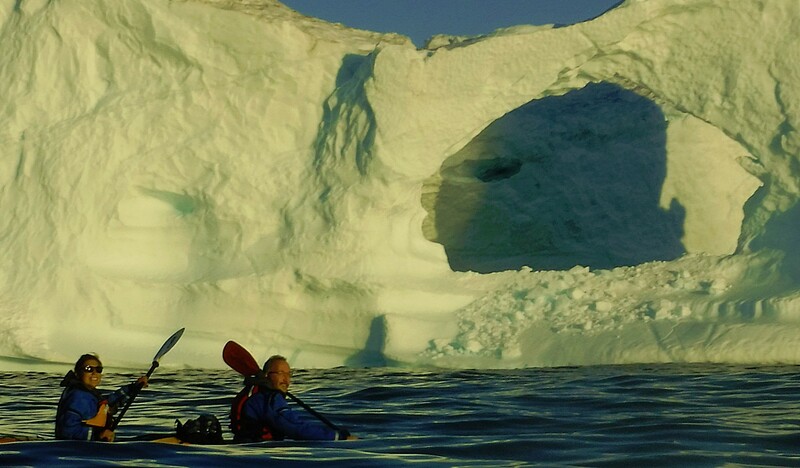 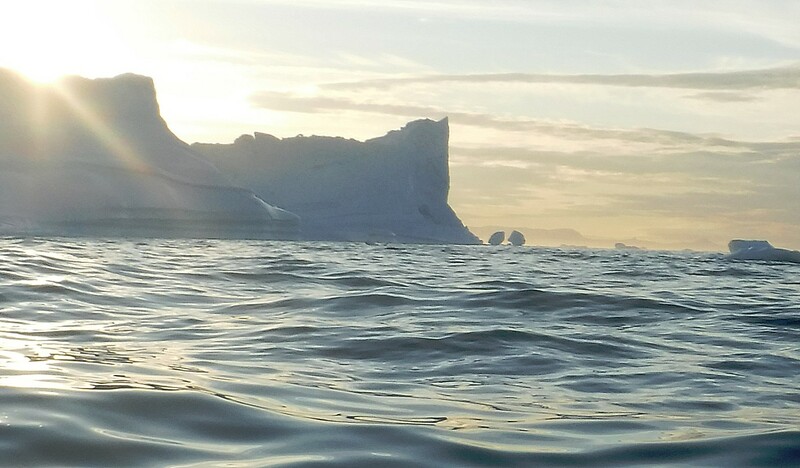 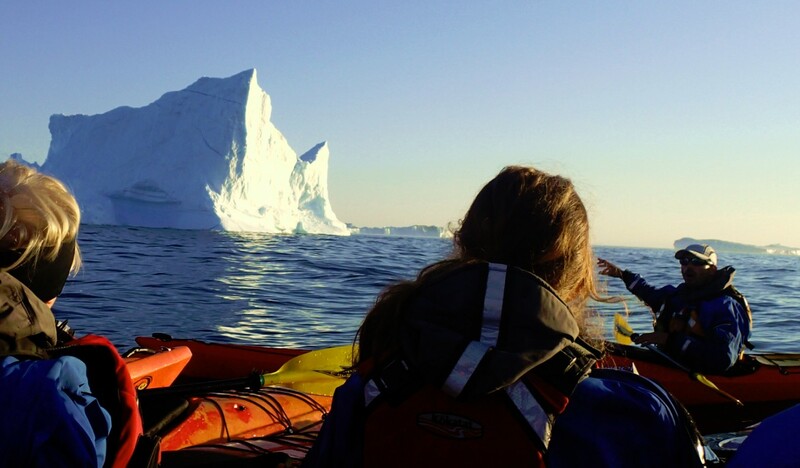 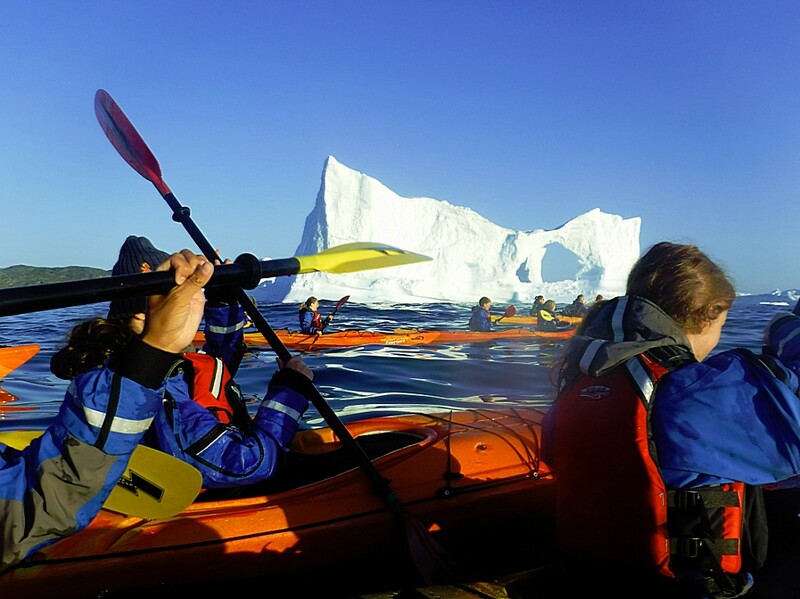 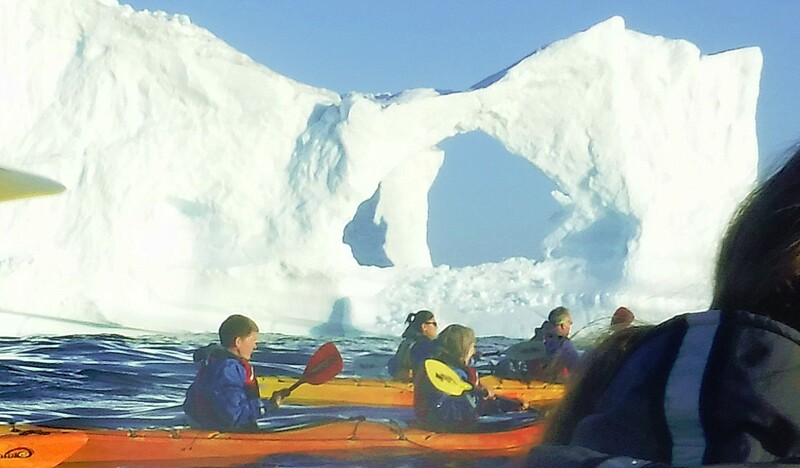 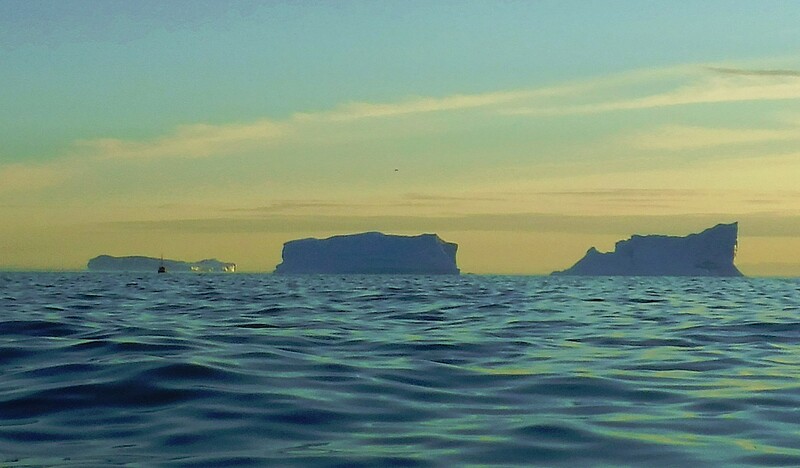 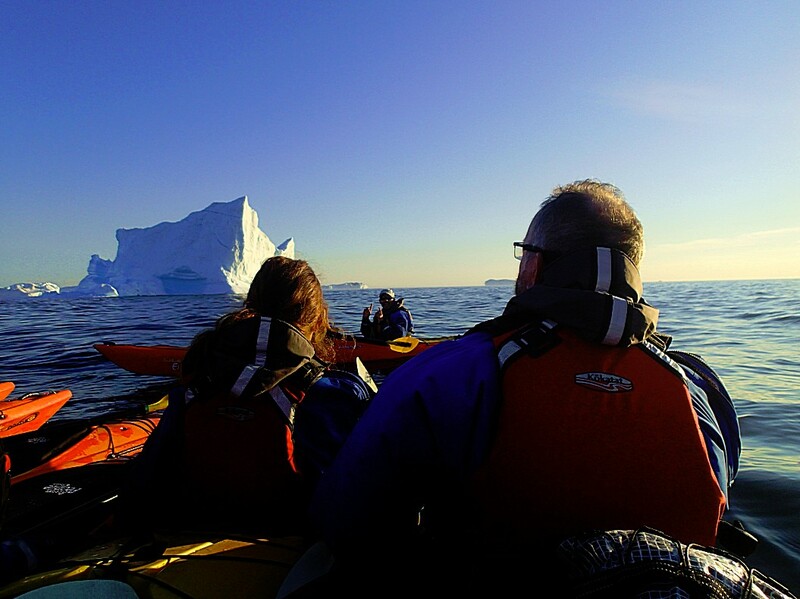 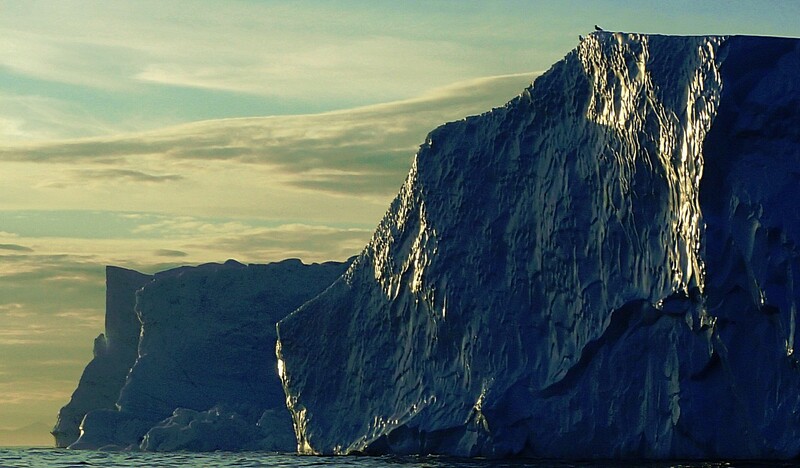 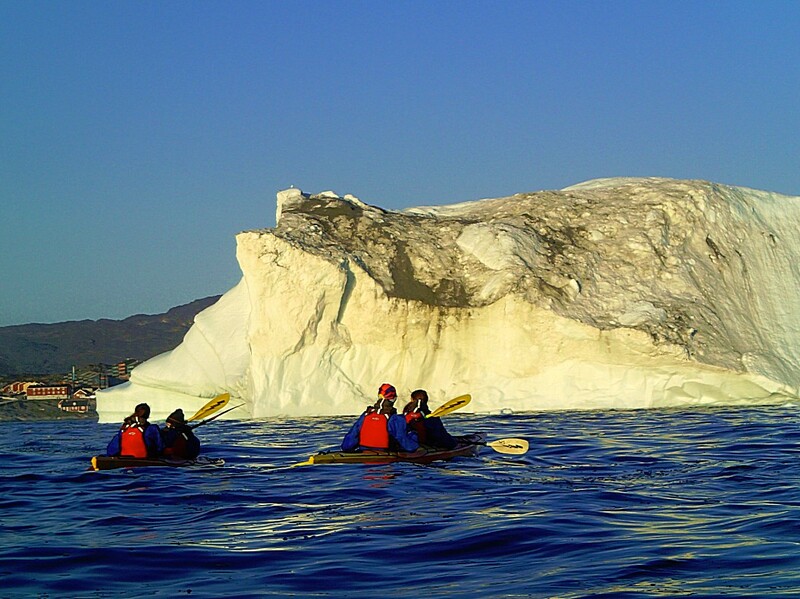 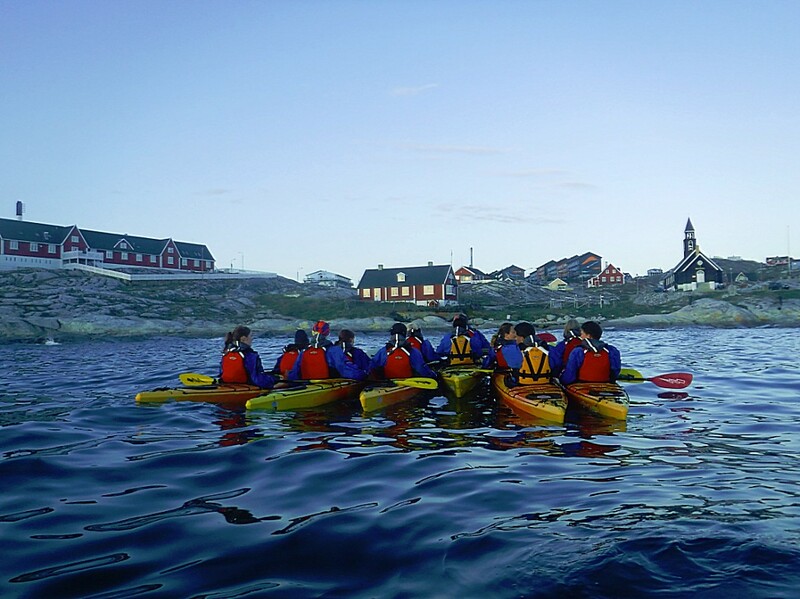 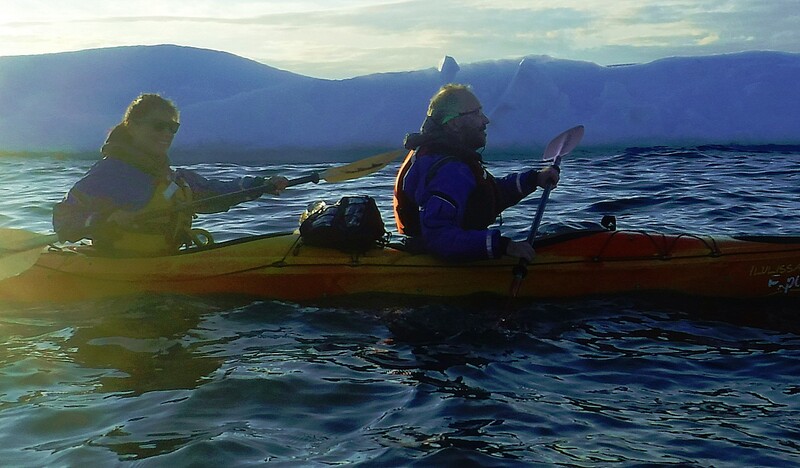 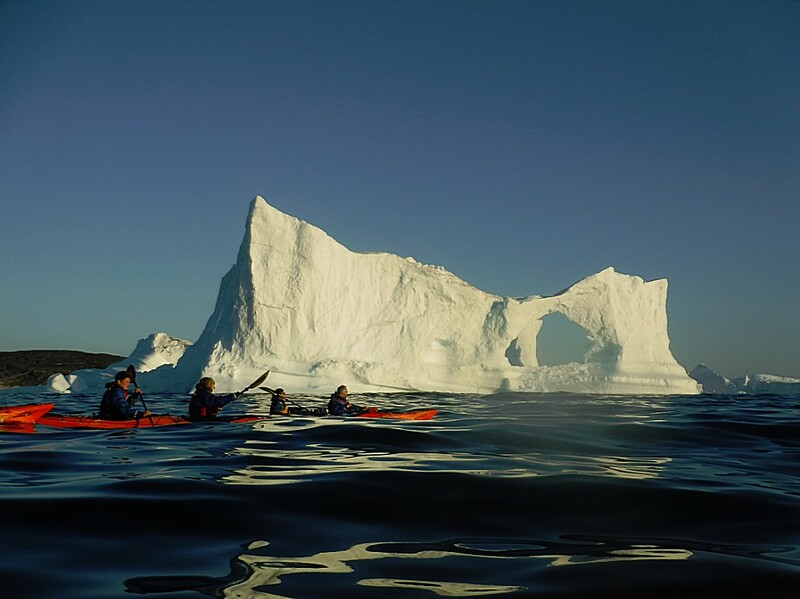 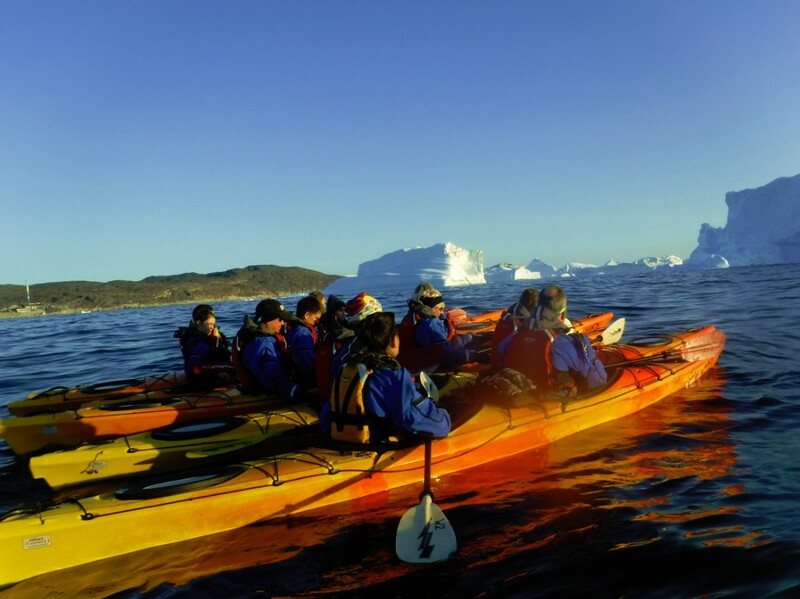 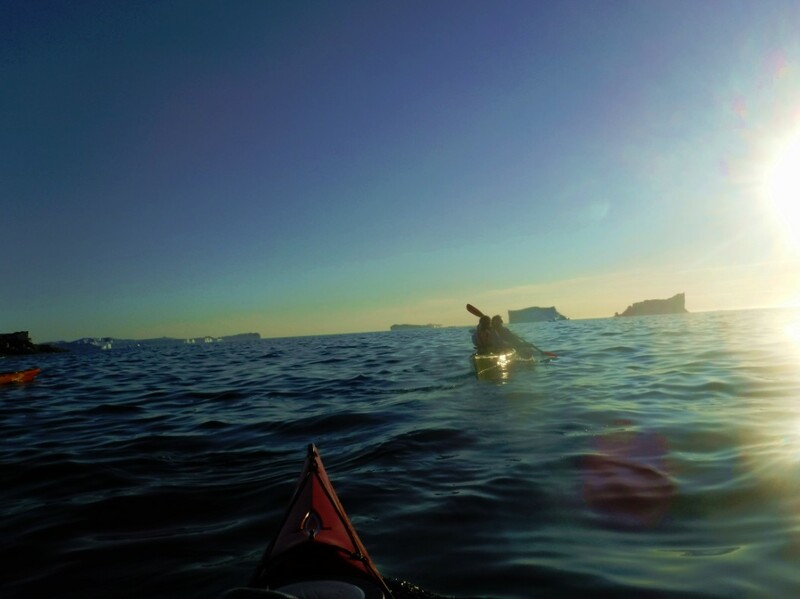 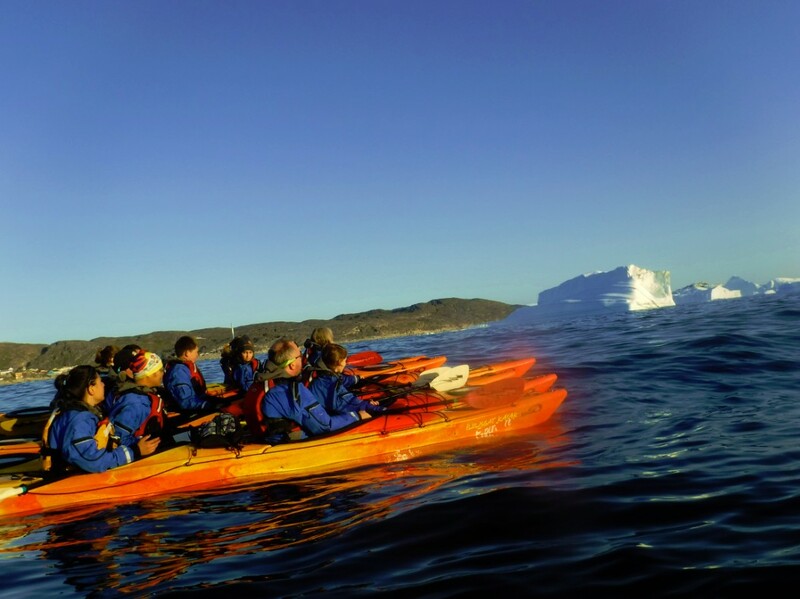 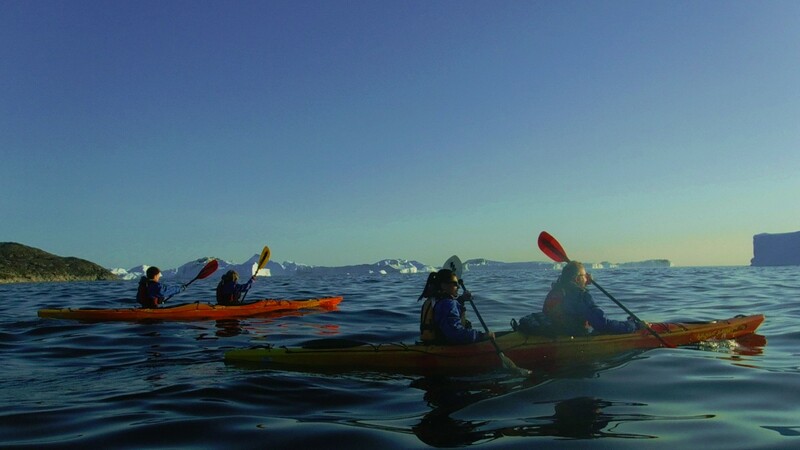 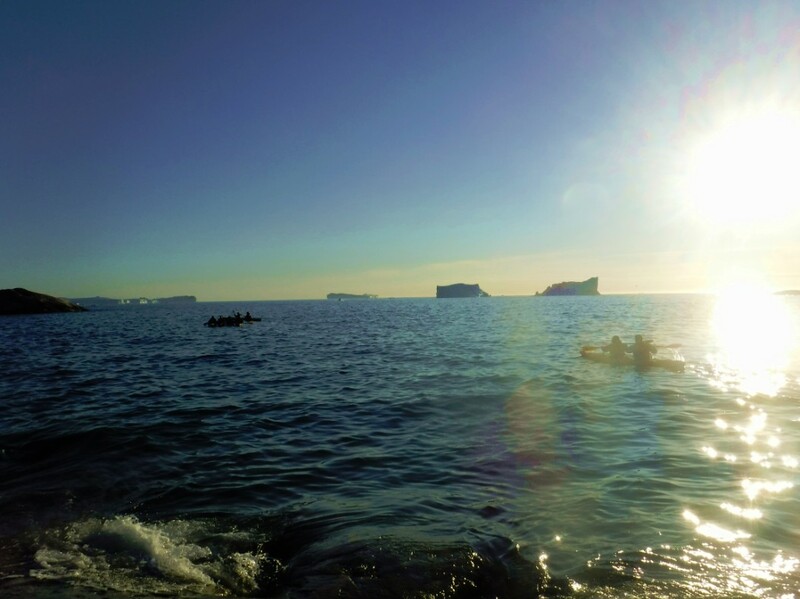 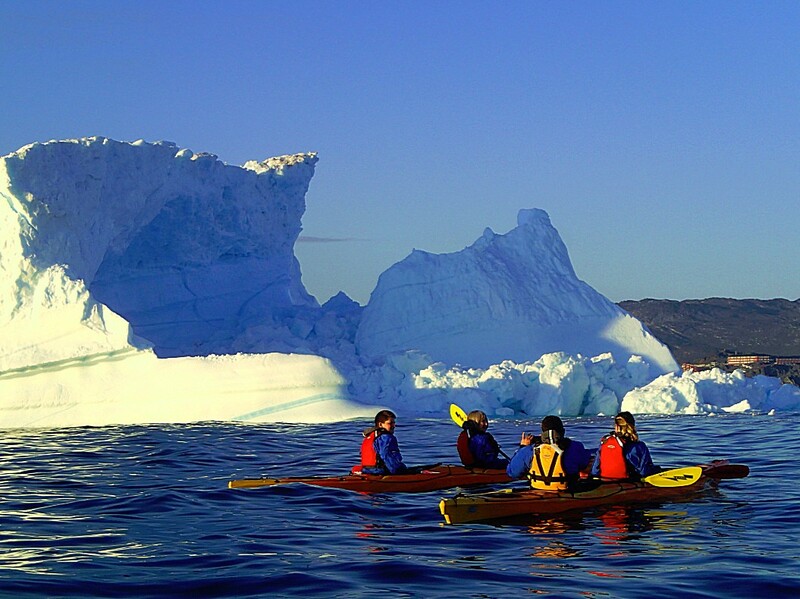 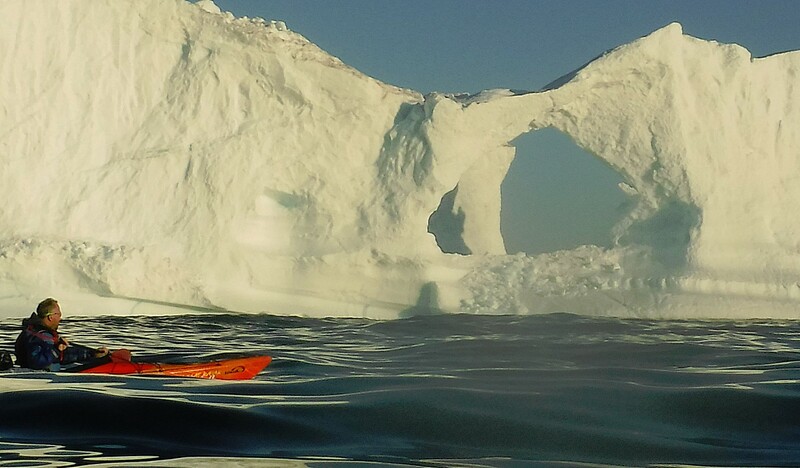 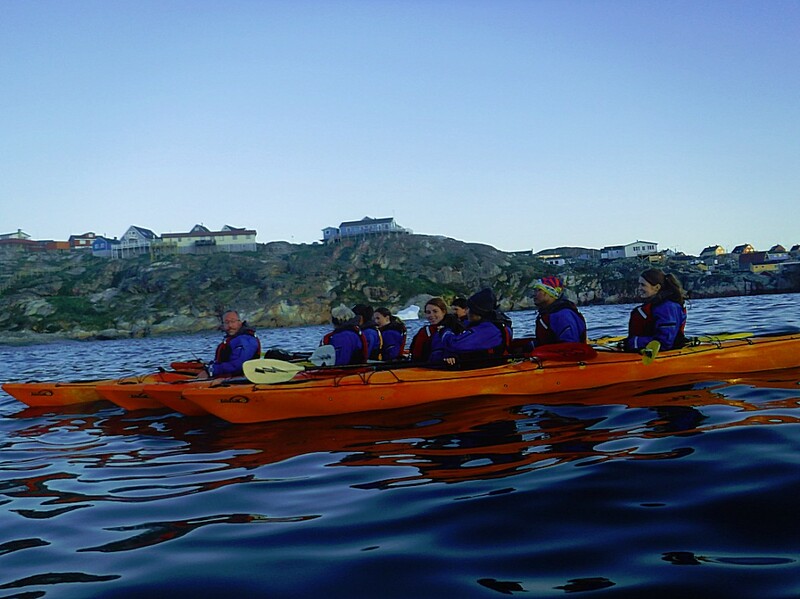 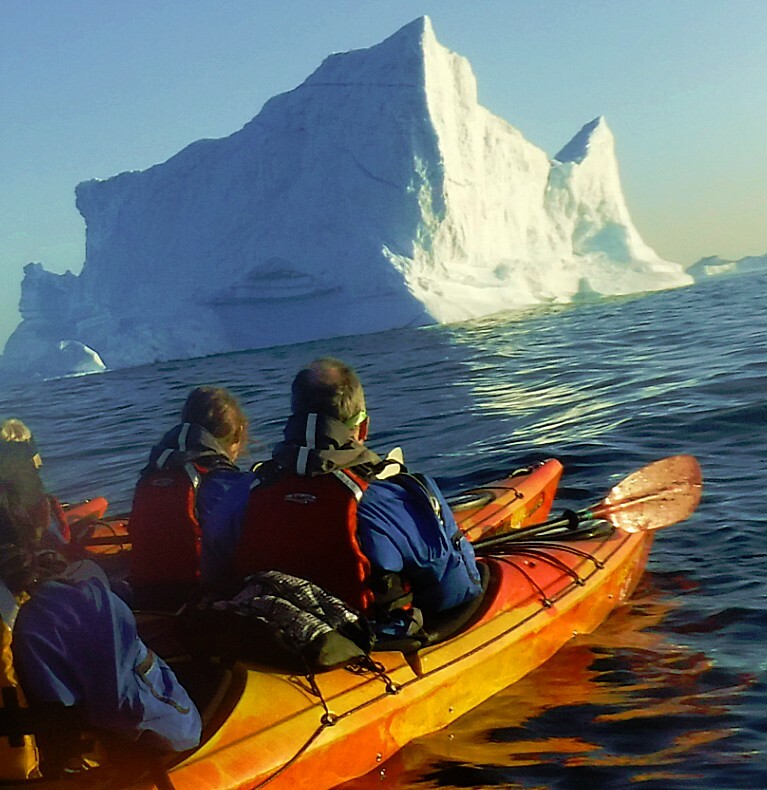 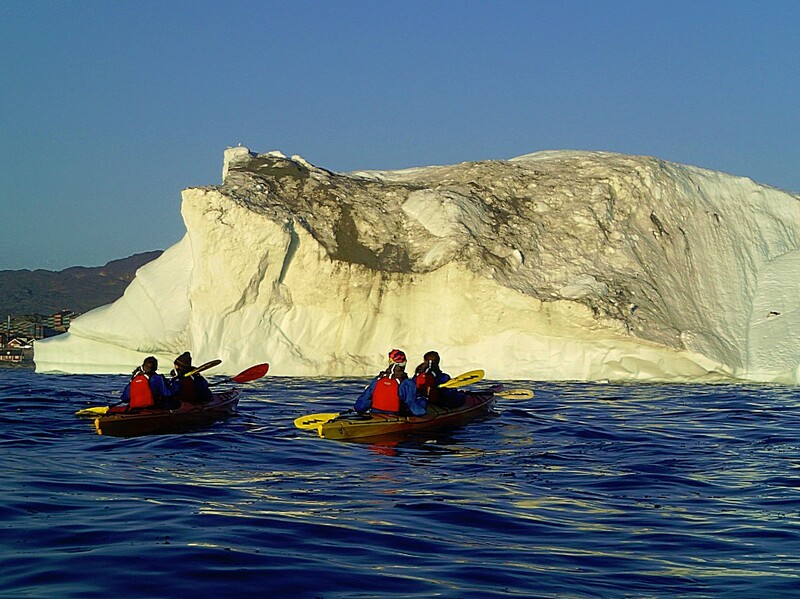 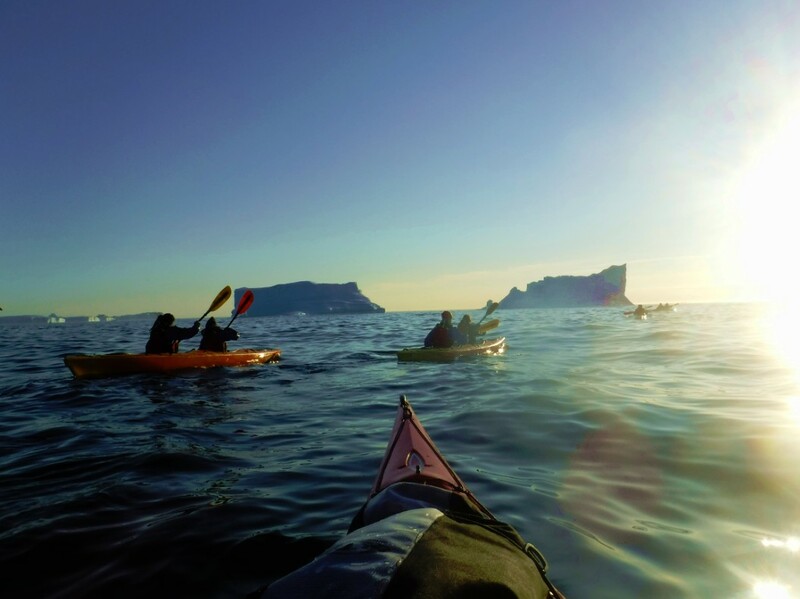 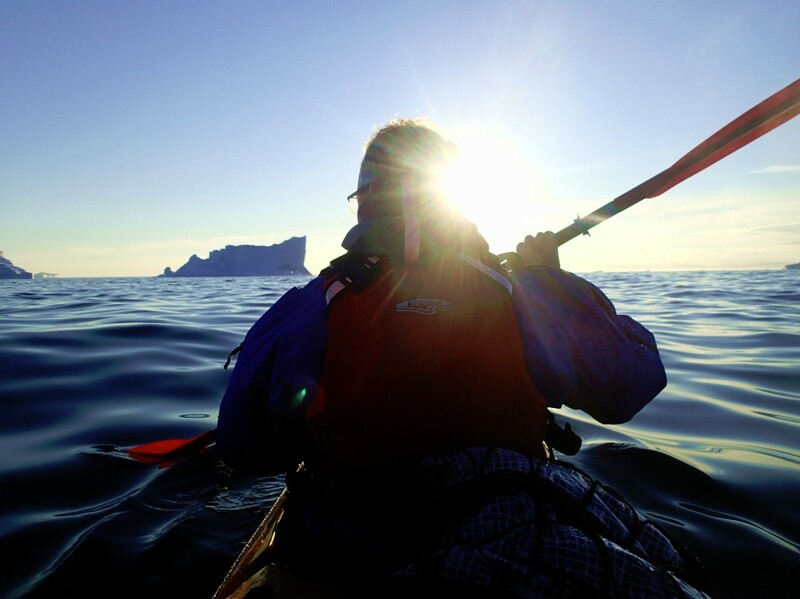 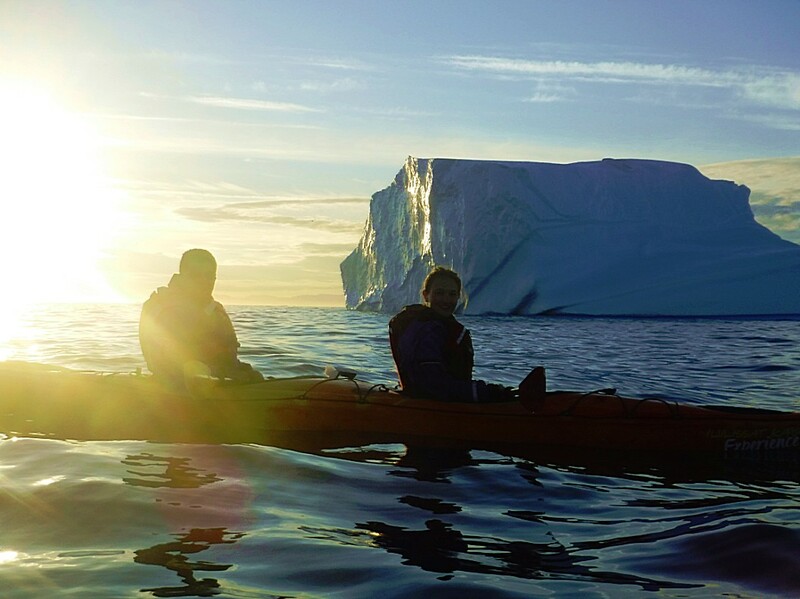 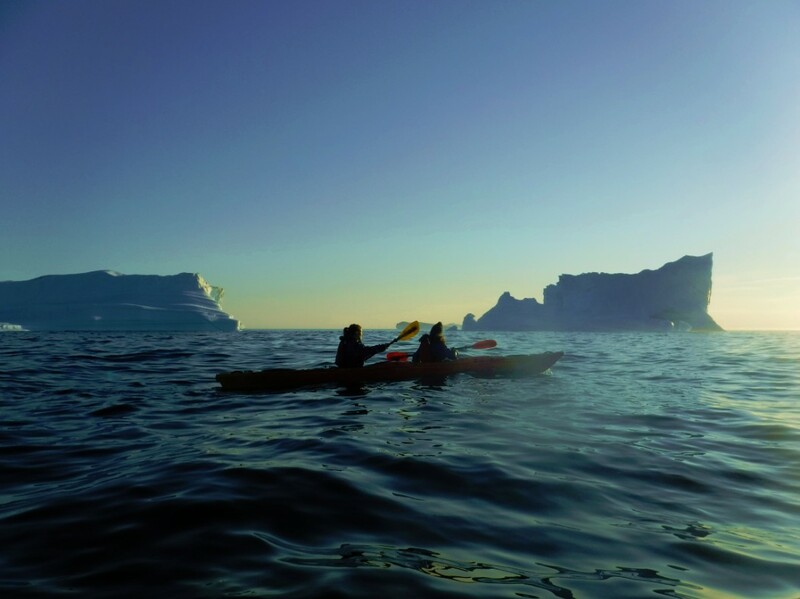 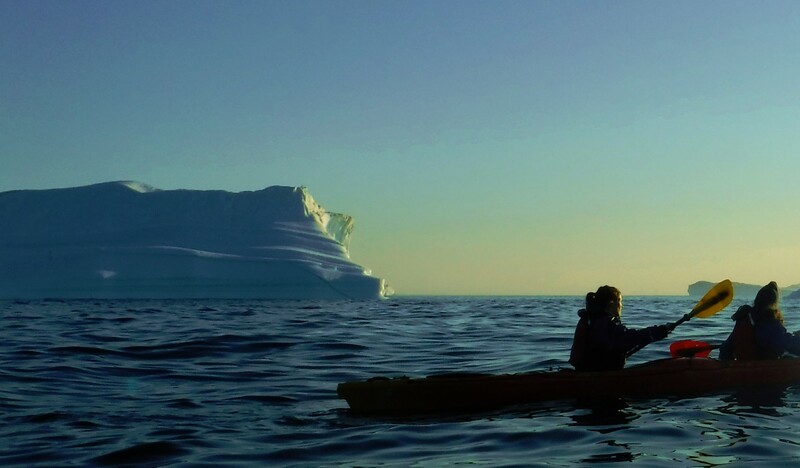 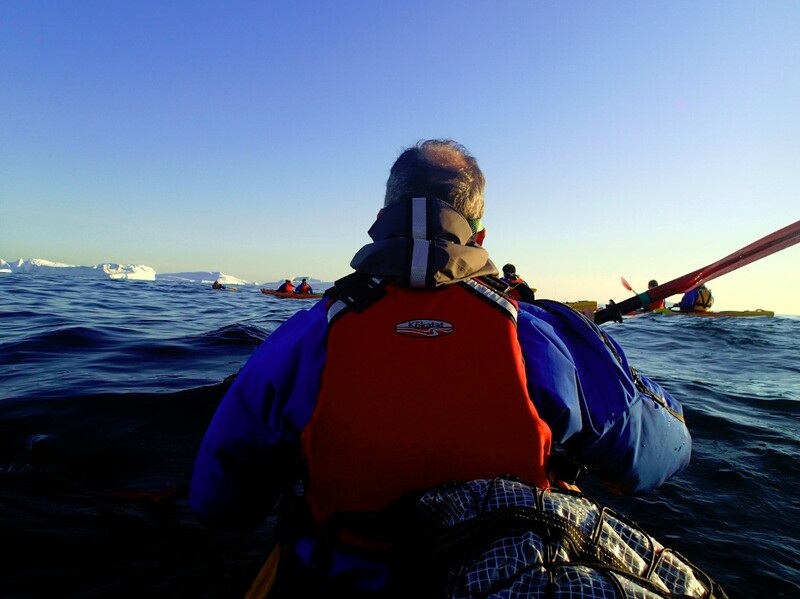 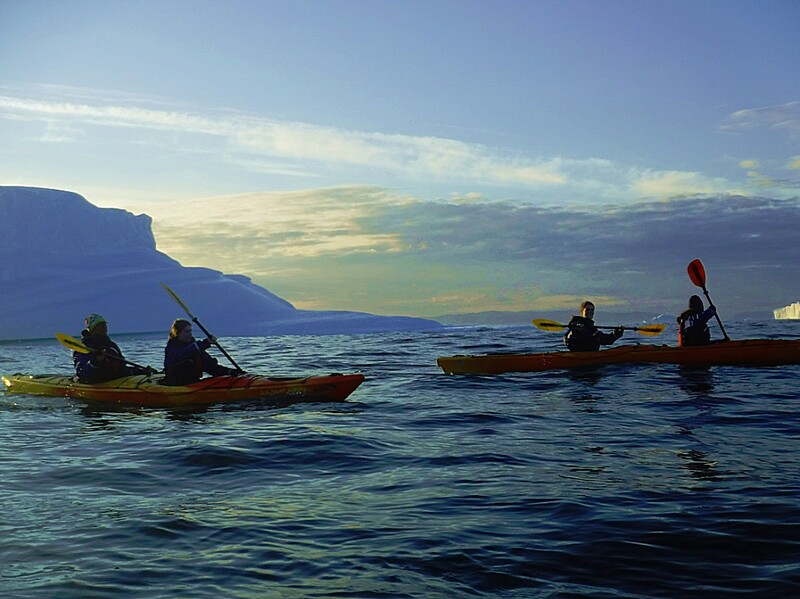 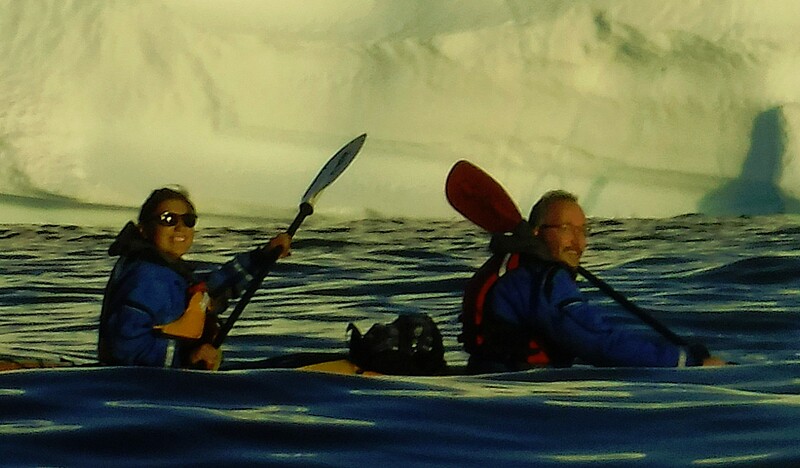 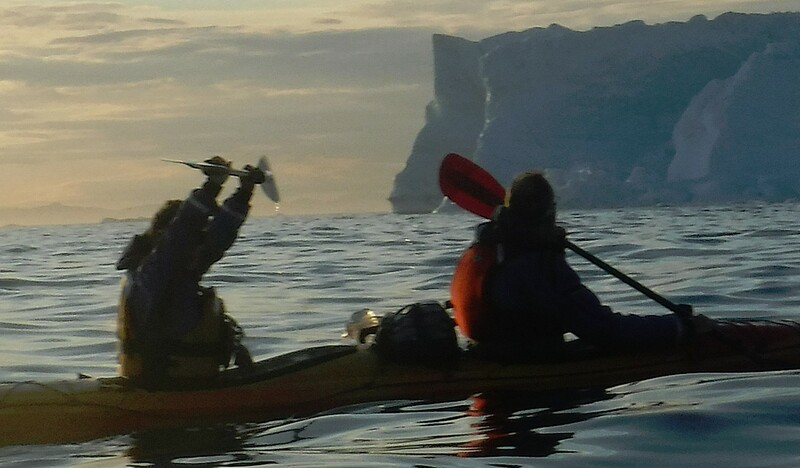 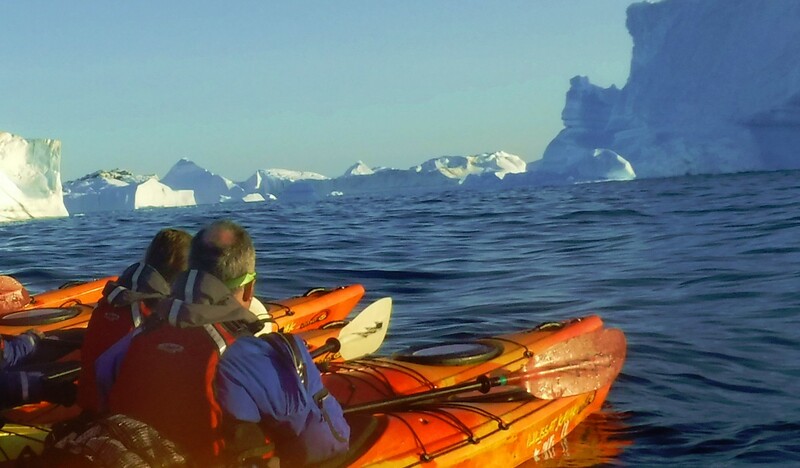 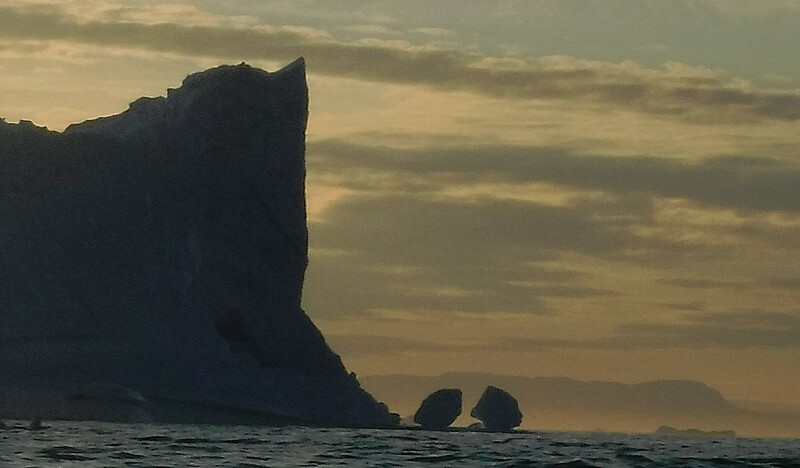 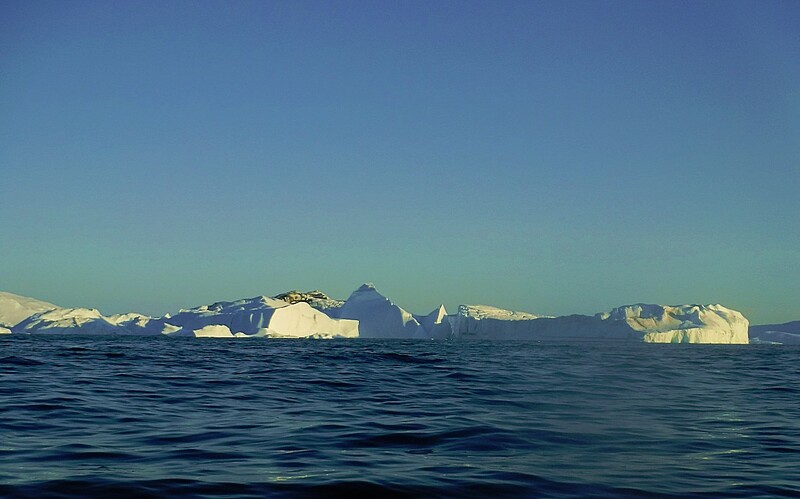 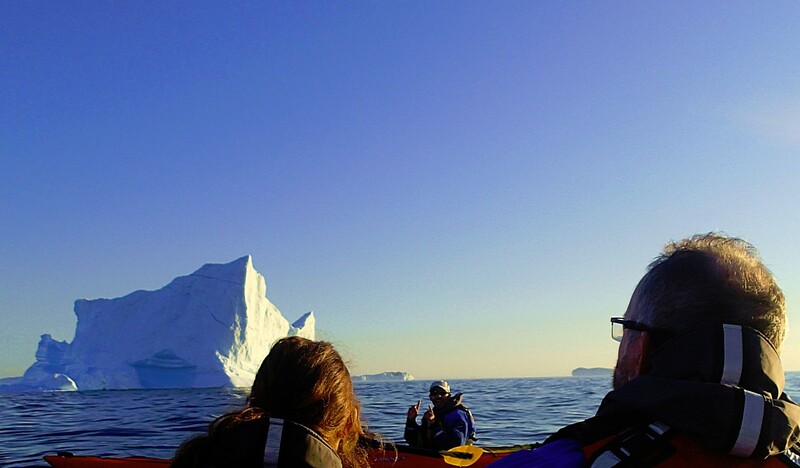 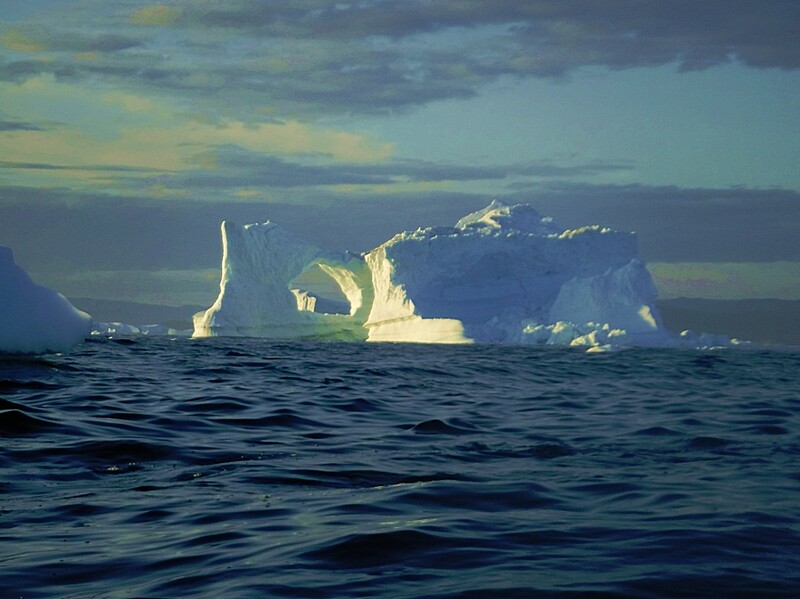 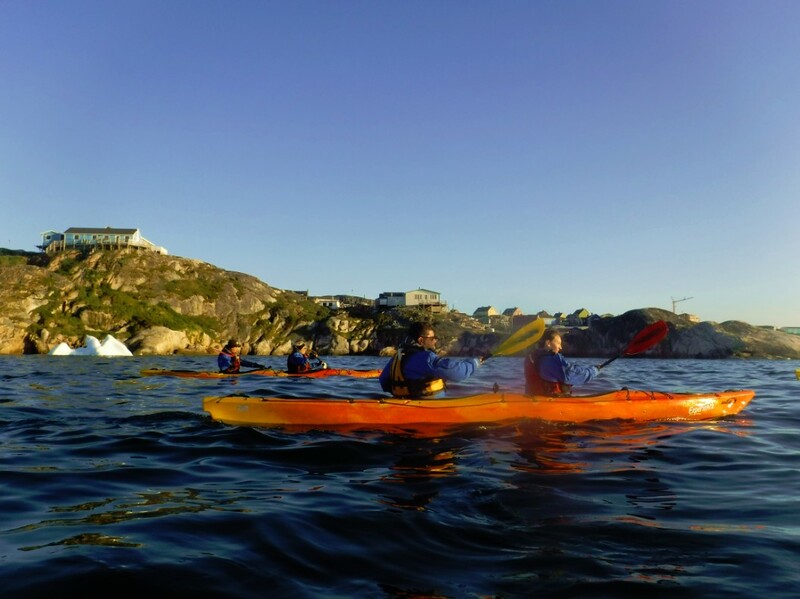 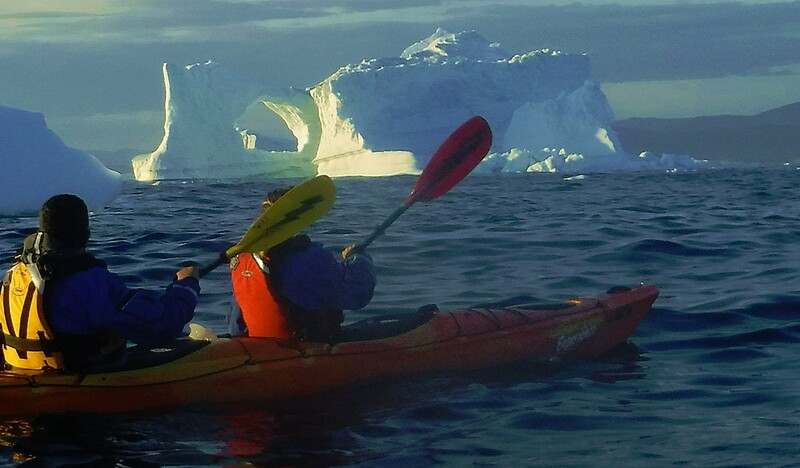 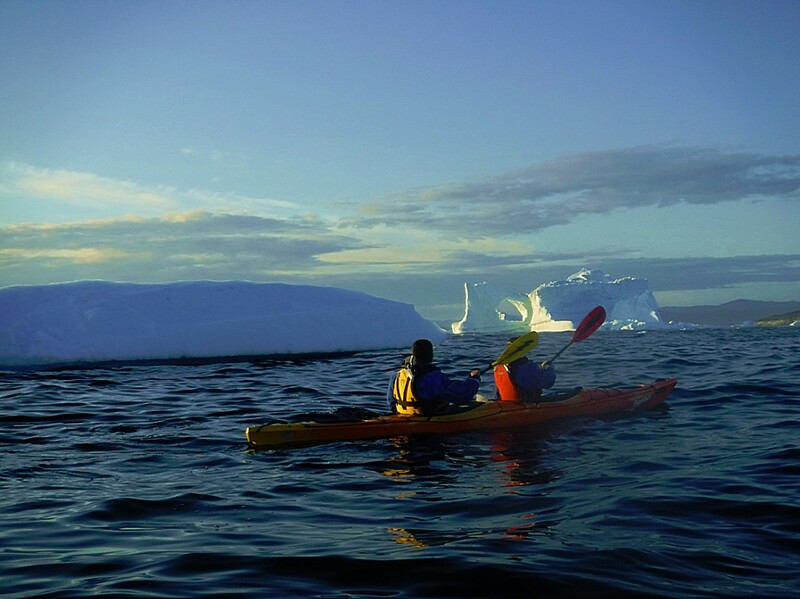 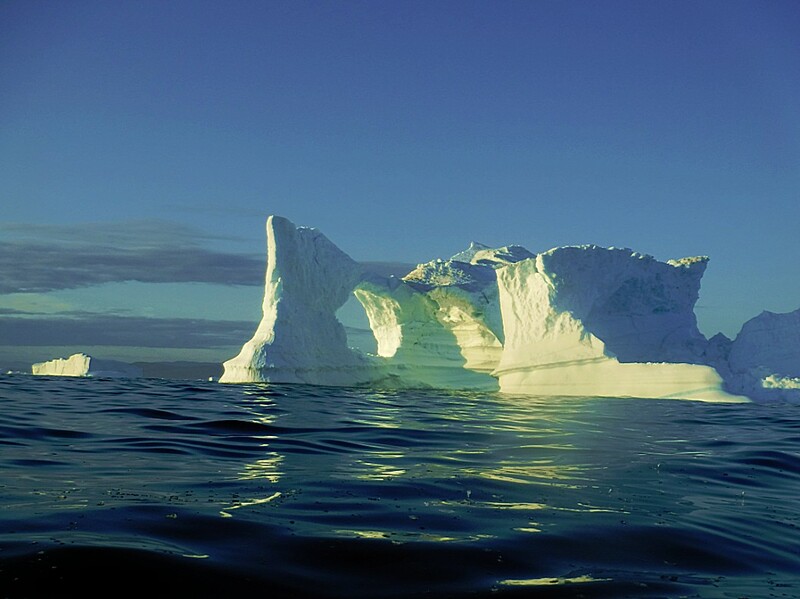 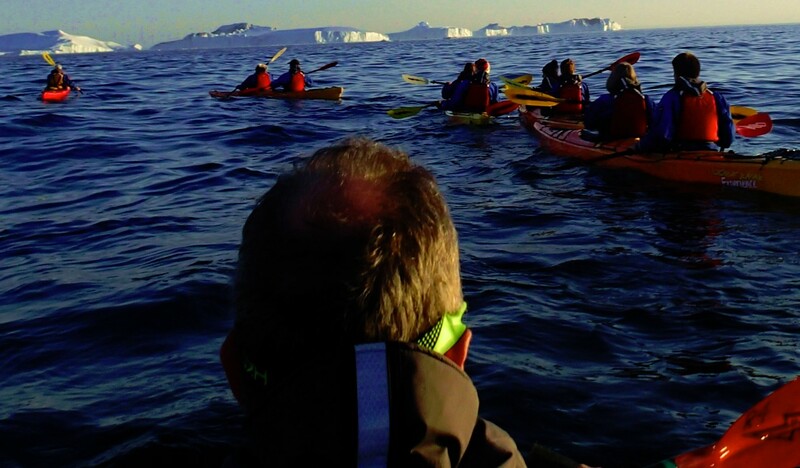 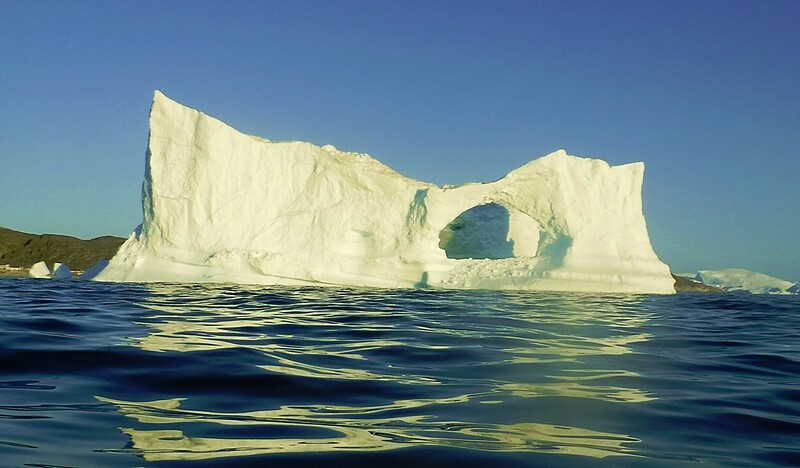 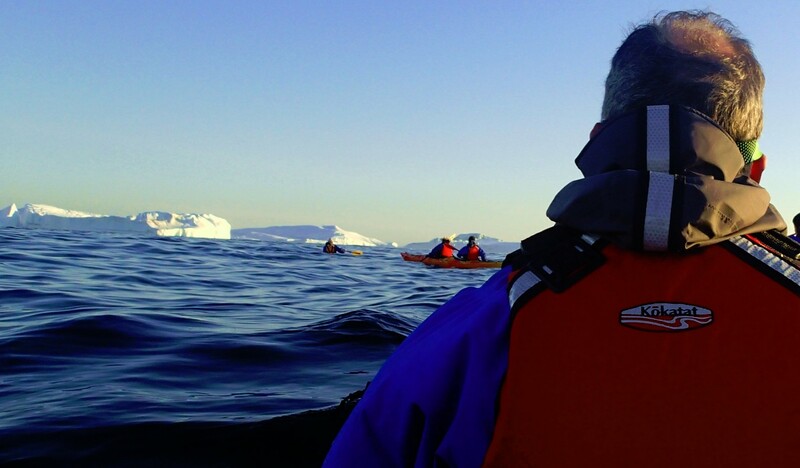 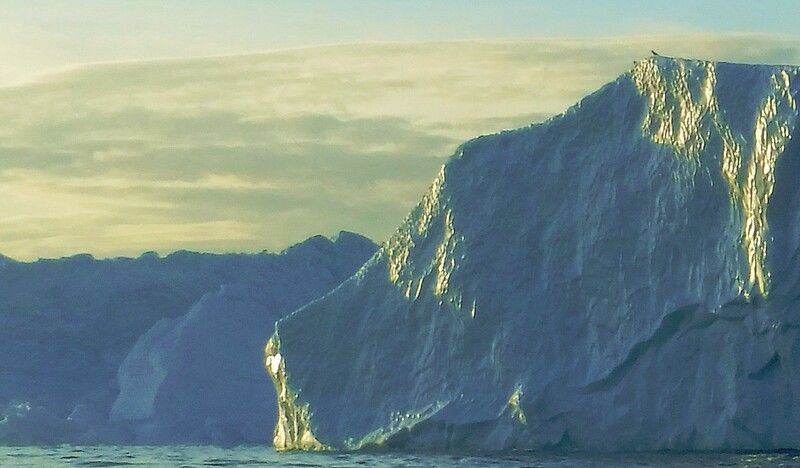 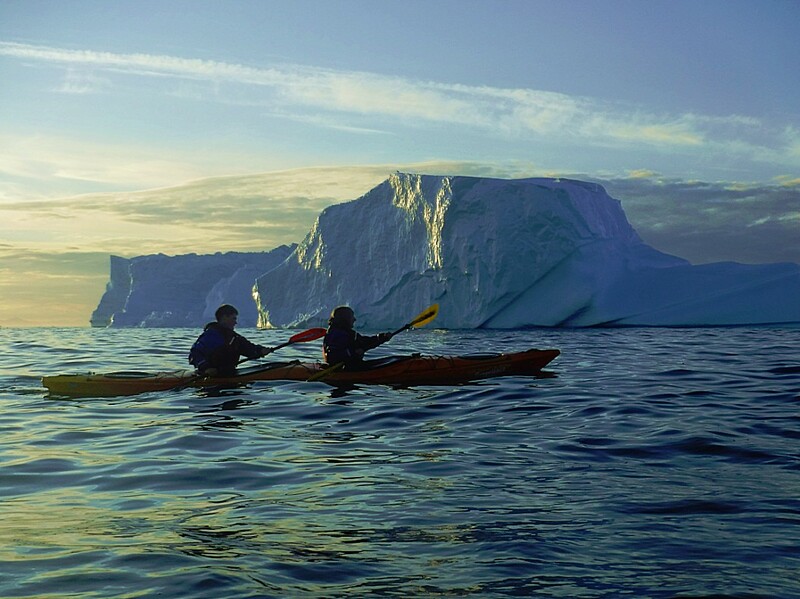 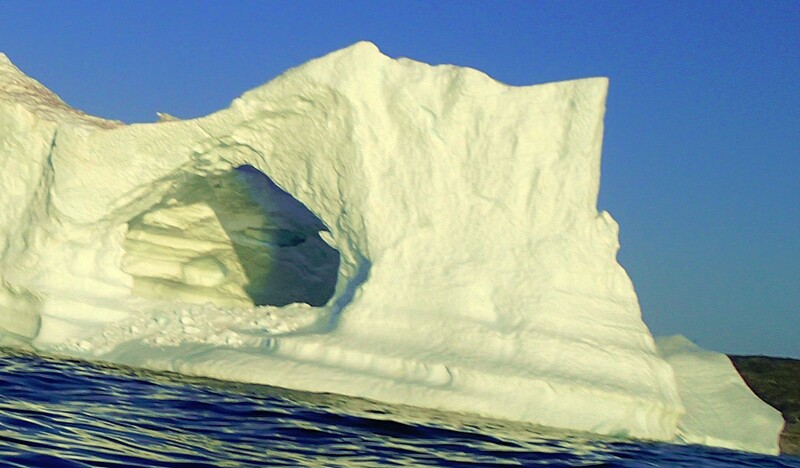 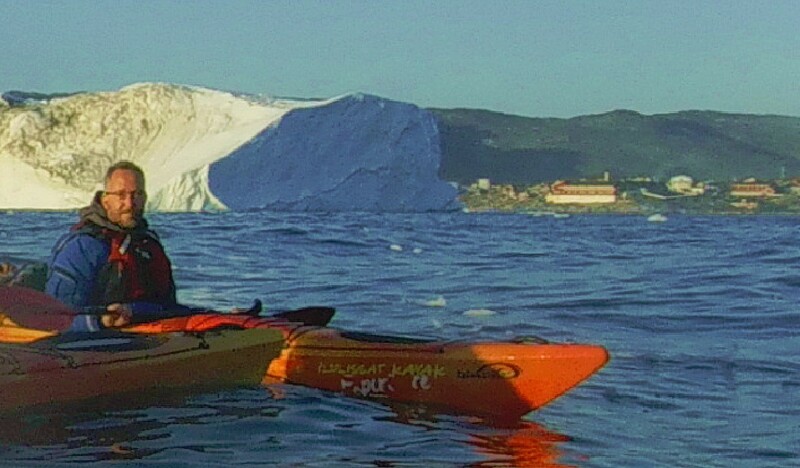 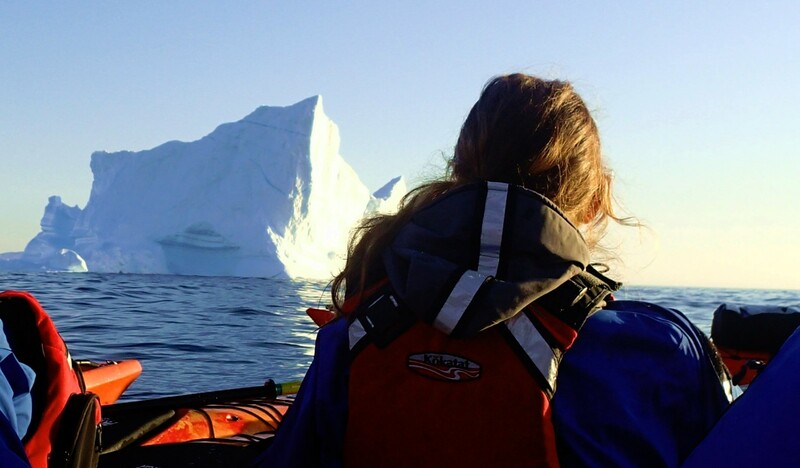 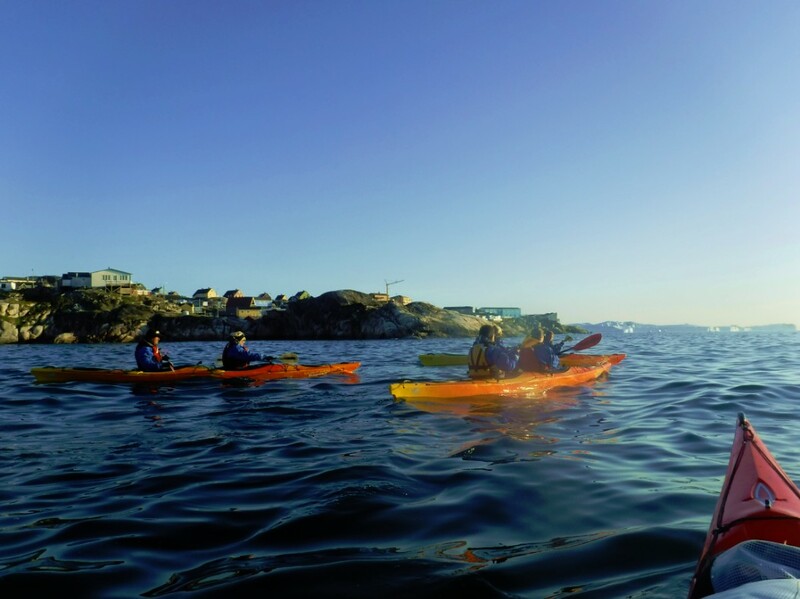 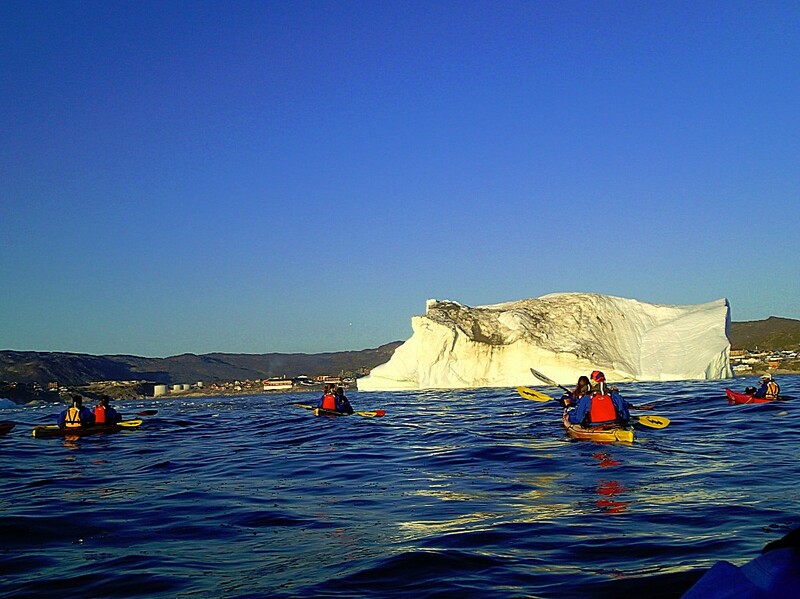 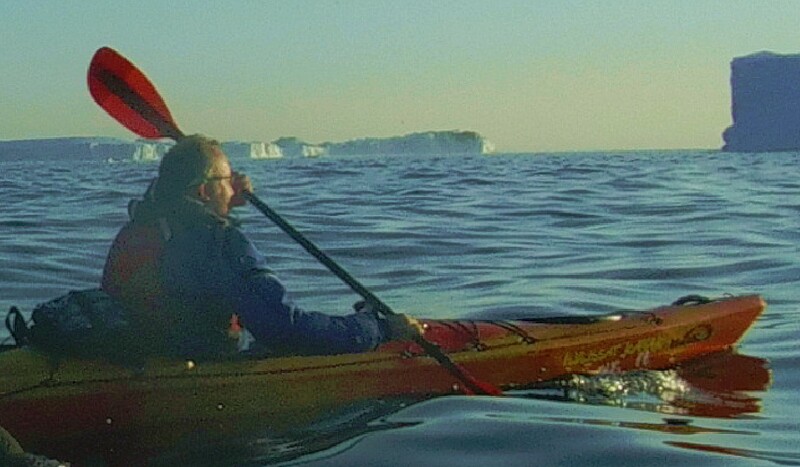 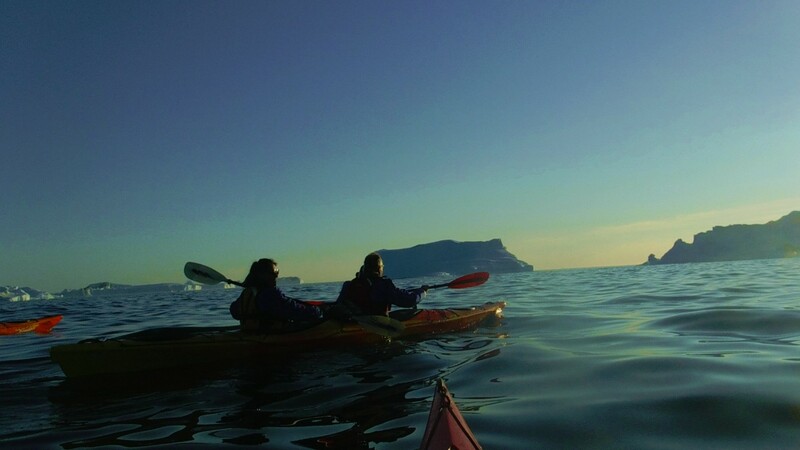 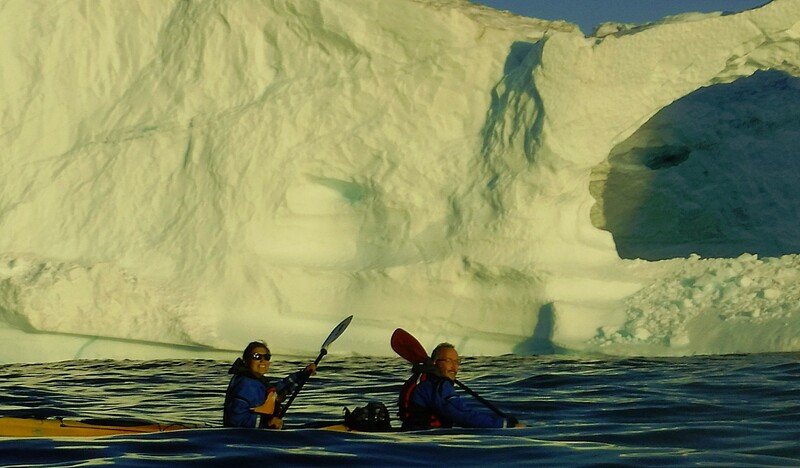 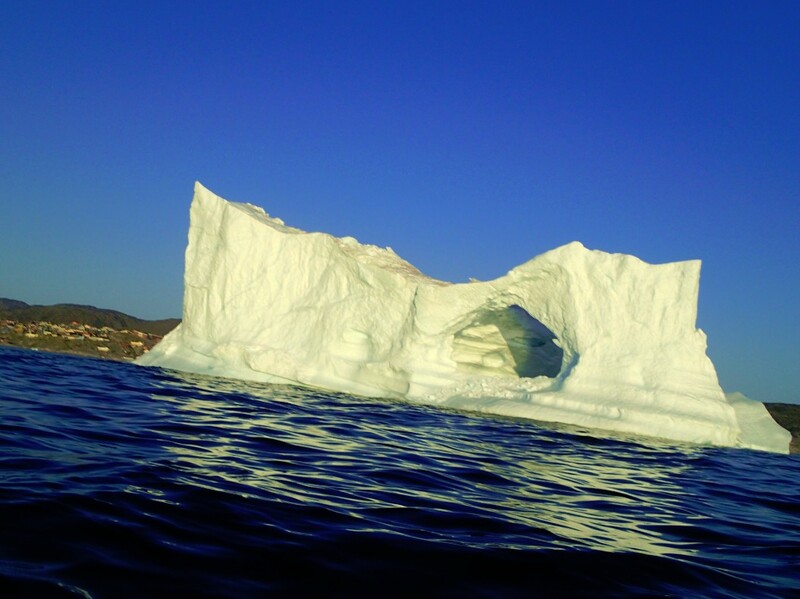 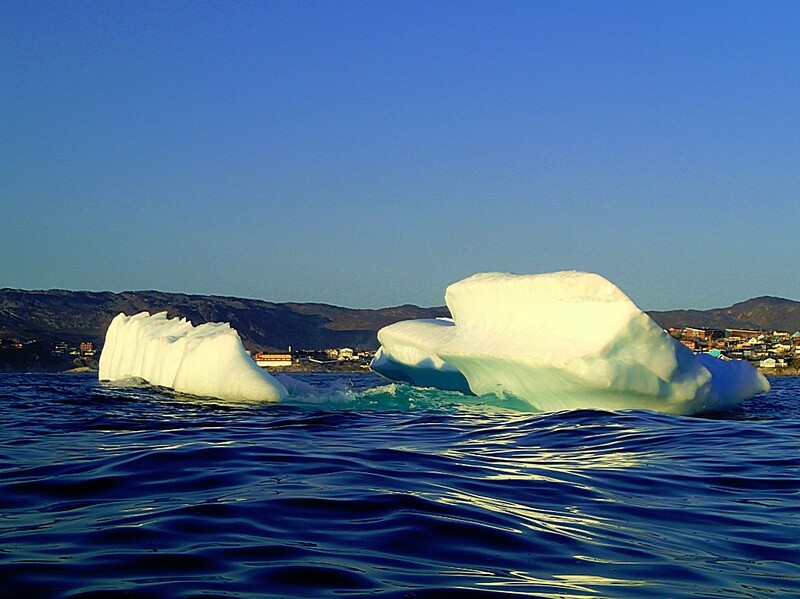 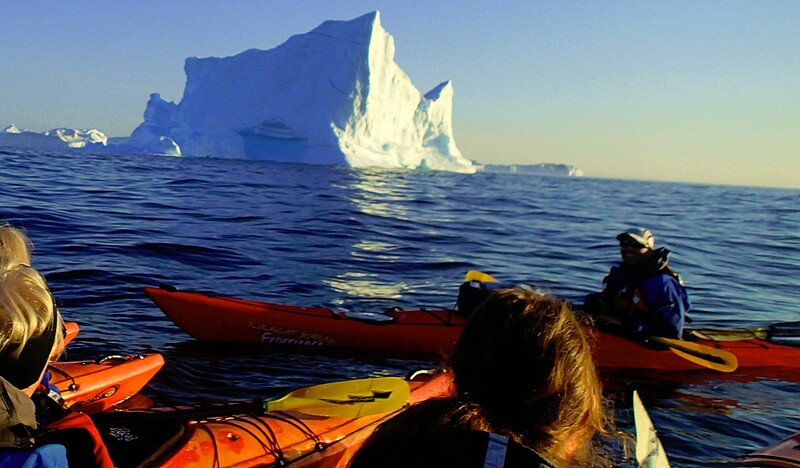 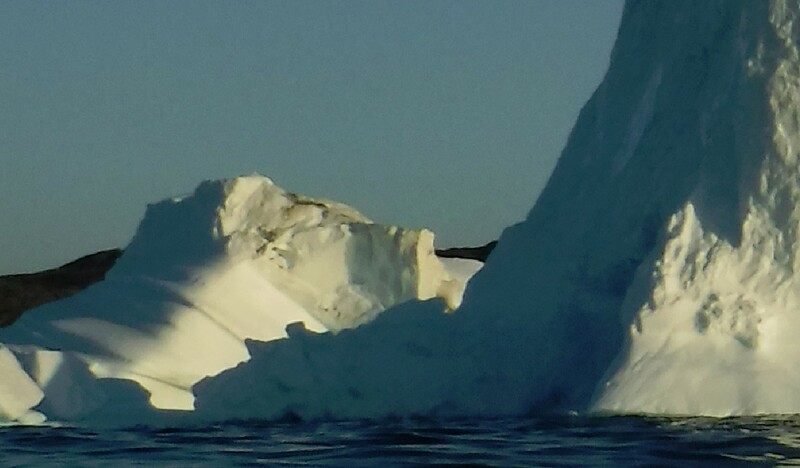 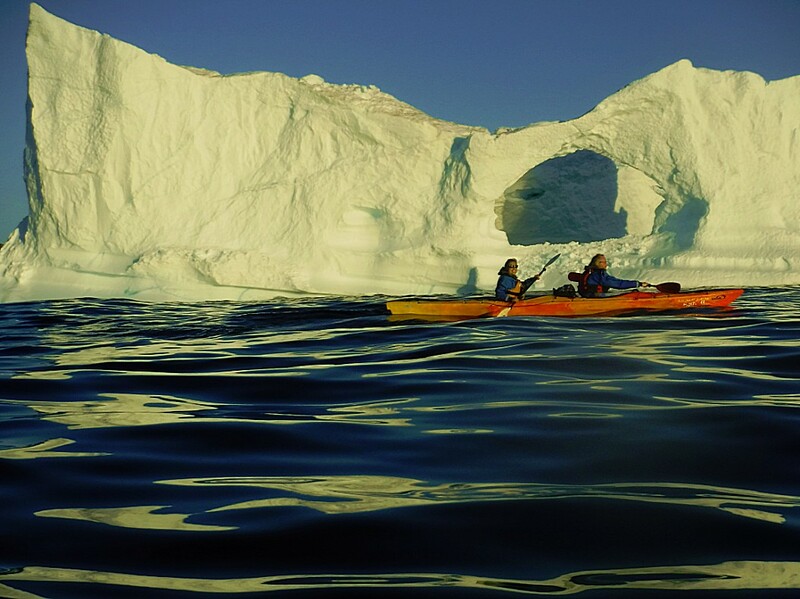 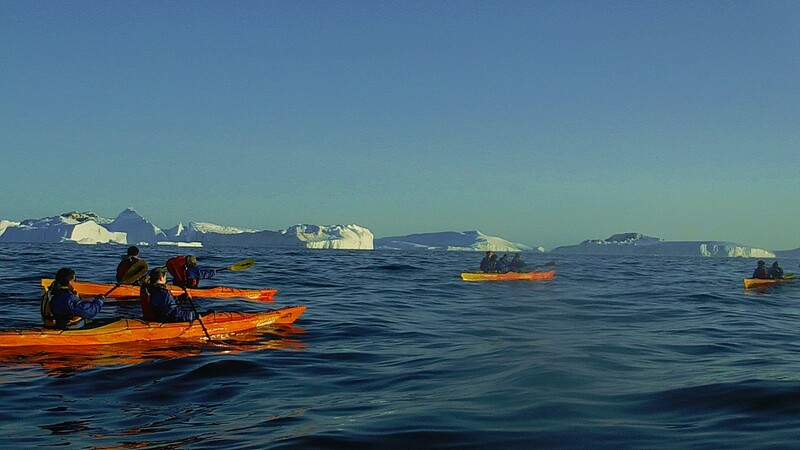 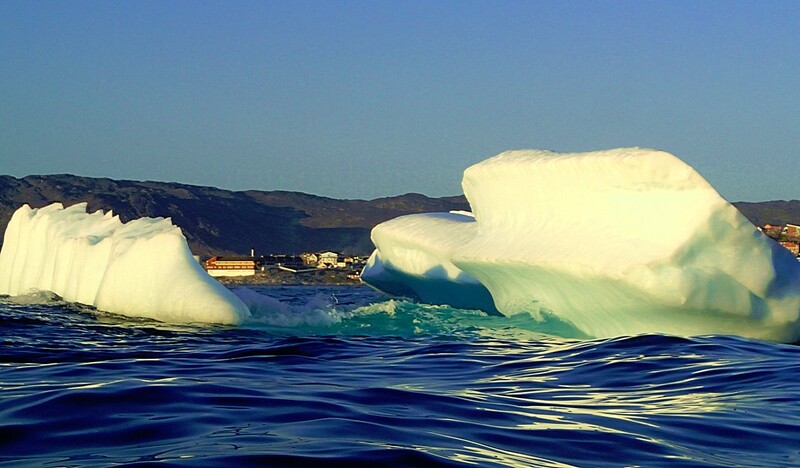 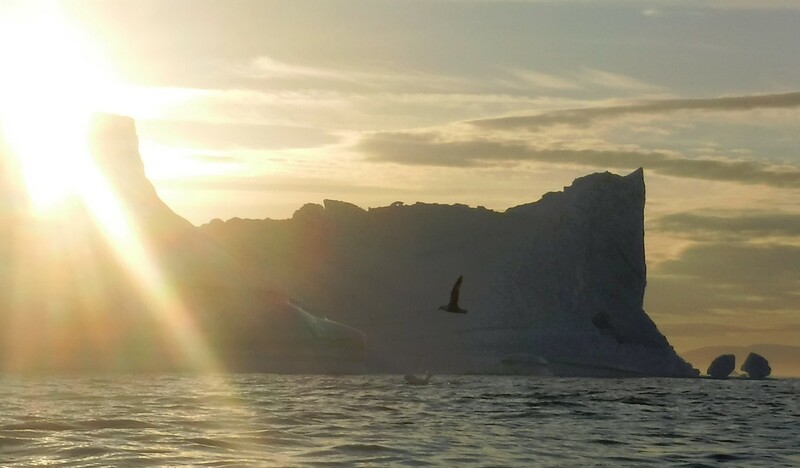 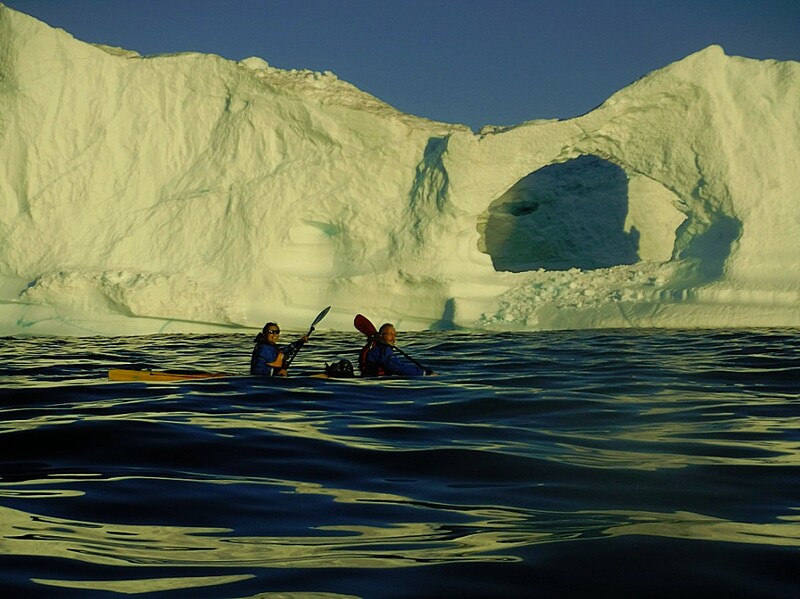 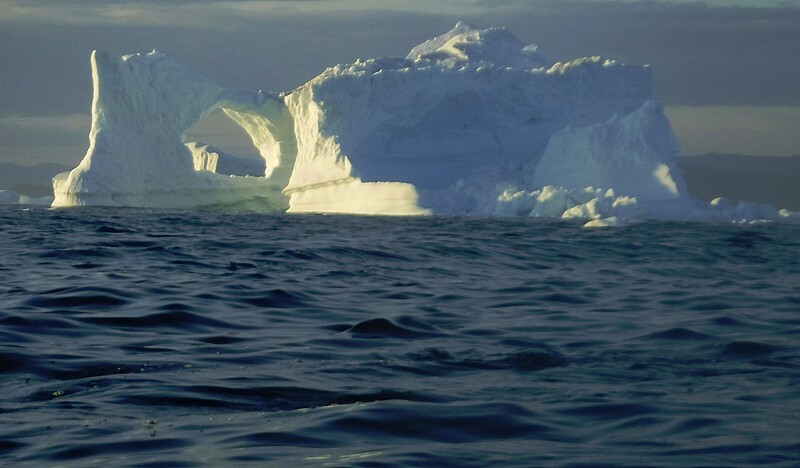 Kayaking between icebergs is a completely different experience from hiking or a helicopterflight. 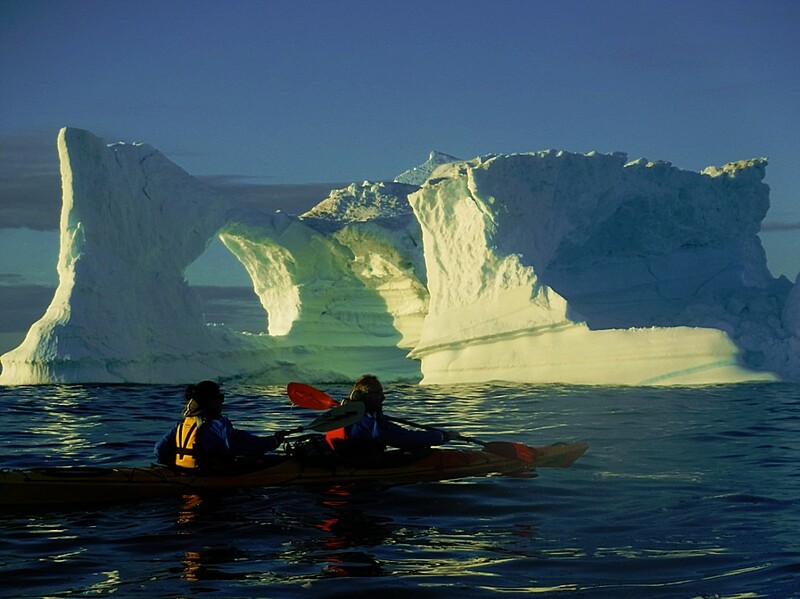 It is more physical and it is the best way to experience the enormous volume of the icebergs that tower high above you. 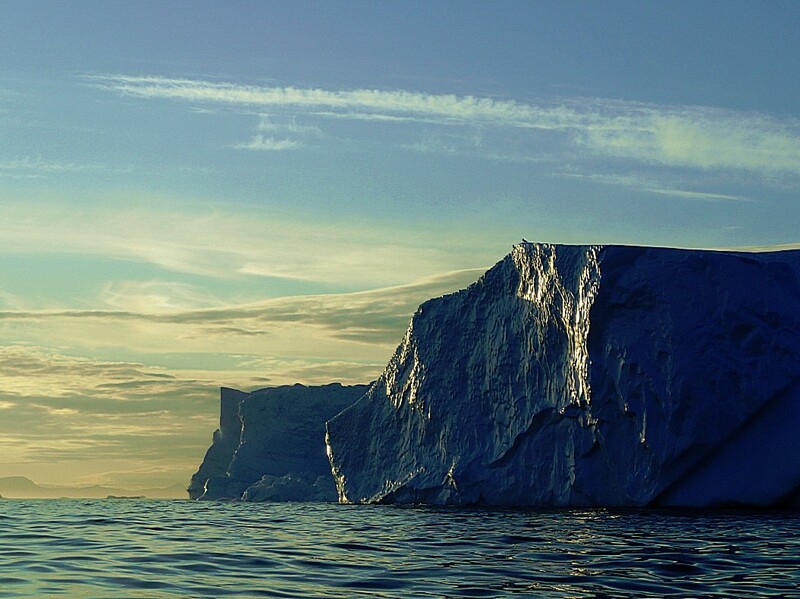 Hard not to be impressed by that. 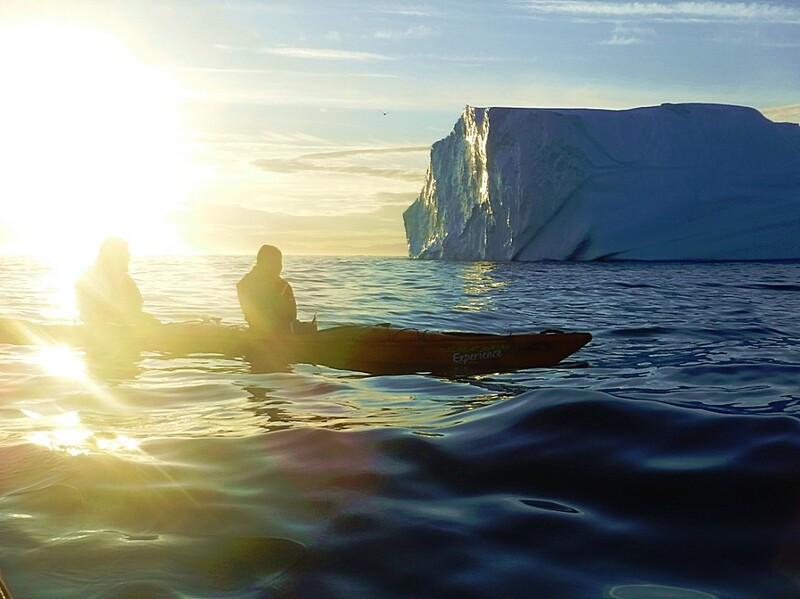 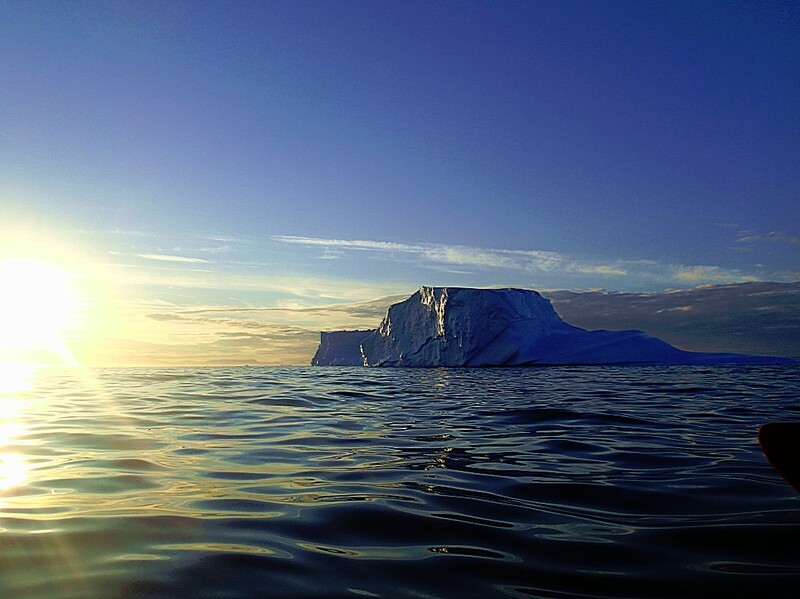 When the sun starts to set in the arctic seas, the white and blue colors of the icebergs dissappear and make room for a much richer color pallette..
…and then we all received a glass of Baileys coffee liquor…on-the-rocks, meaning, filled with ice cubes from the piece of black ice which we found while kayaking. 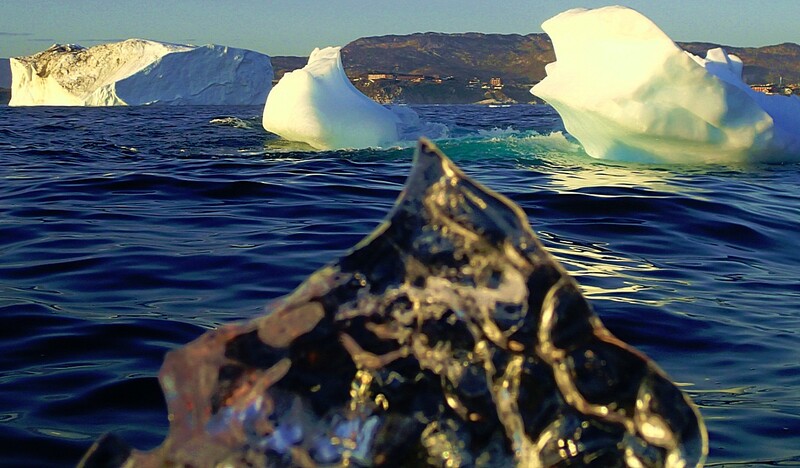 It was not sea ice, but black ice derived from a lake on an iceberg (It was summer and way to warm for sea ice). 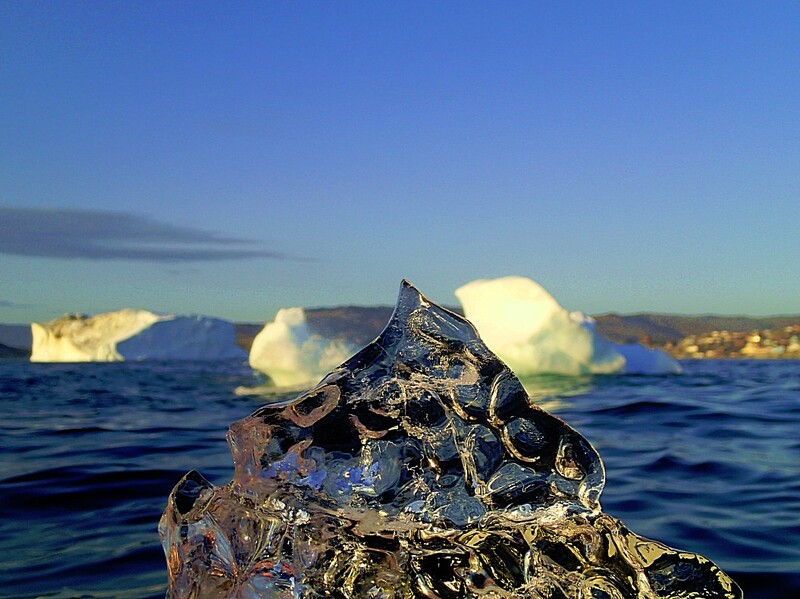 These icecubes were probably ten thousands of years old :-). 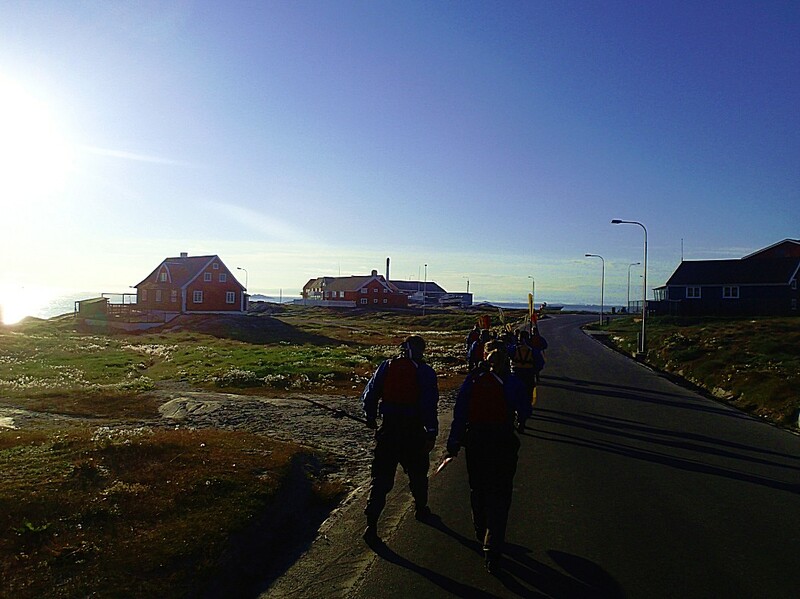 Then we returned to PGI-Greenland office and shed the dry suits and dressed. 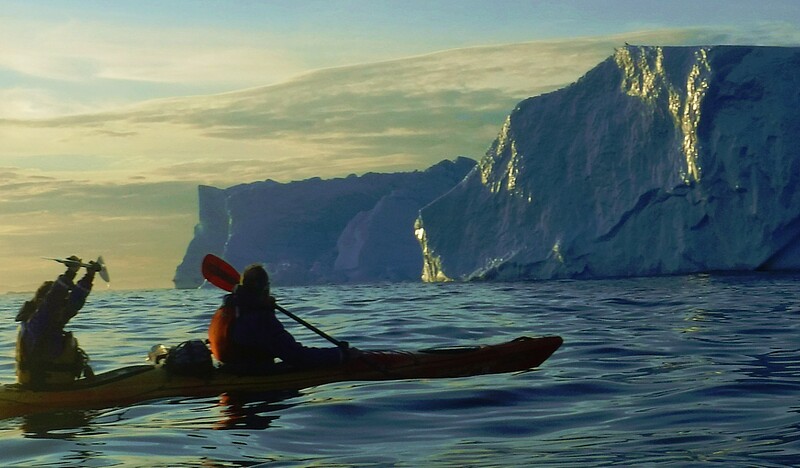 At the office we got a usb-stick loaded with beautiful pics and movies. 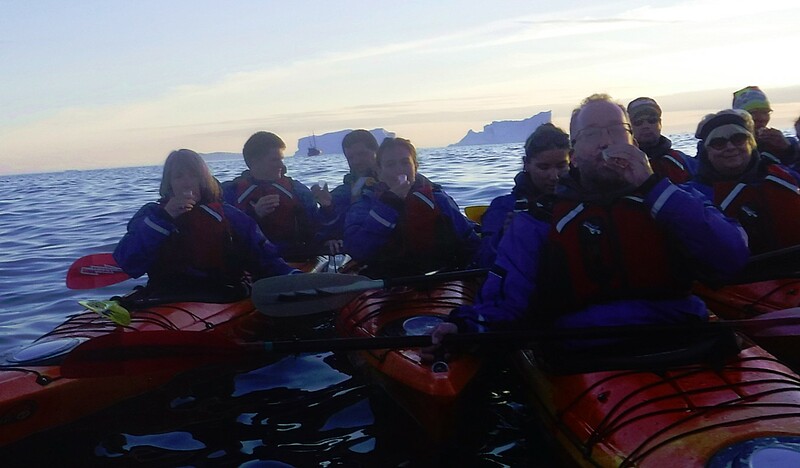 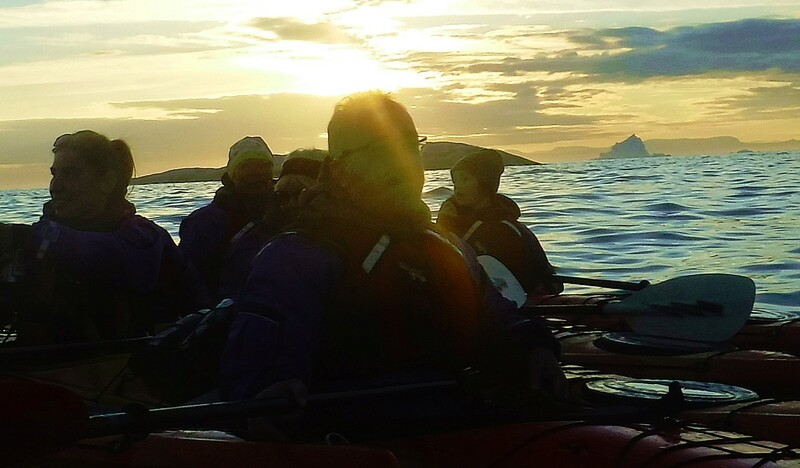 Then I left and was picked up by a pendle bus that brought me to Hotel Arctic, where I visited the restaurant bar for a cold beer and to rewind my memories of this fantastc evening kayak tour.